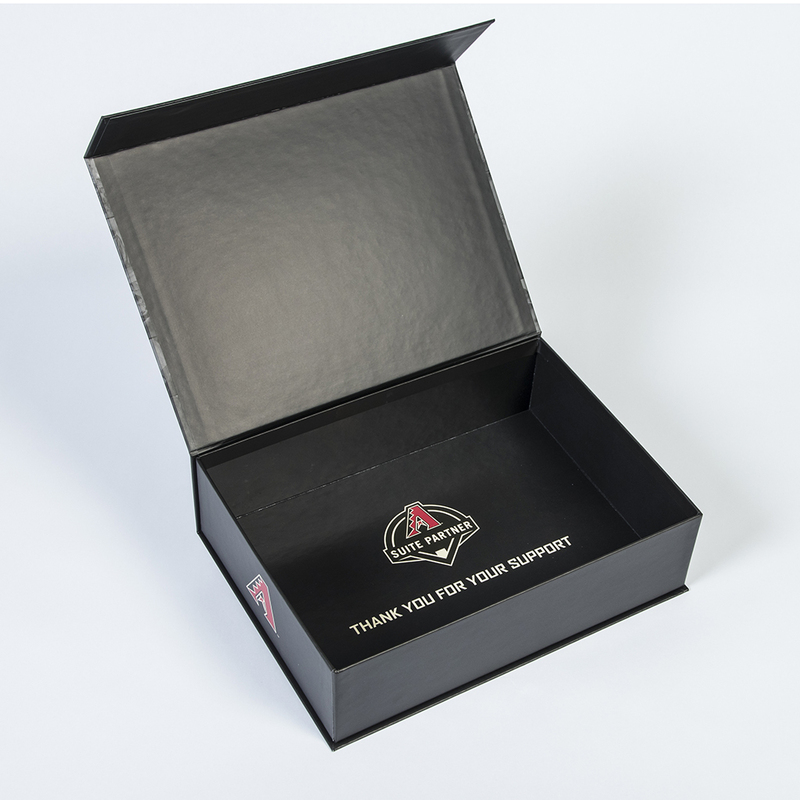 Increase brand awareness and fan appreciation with our custom designed and sized packaging. 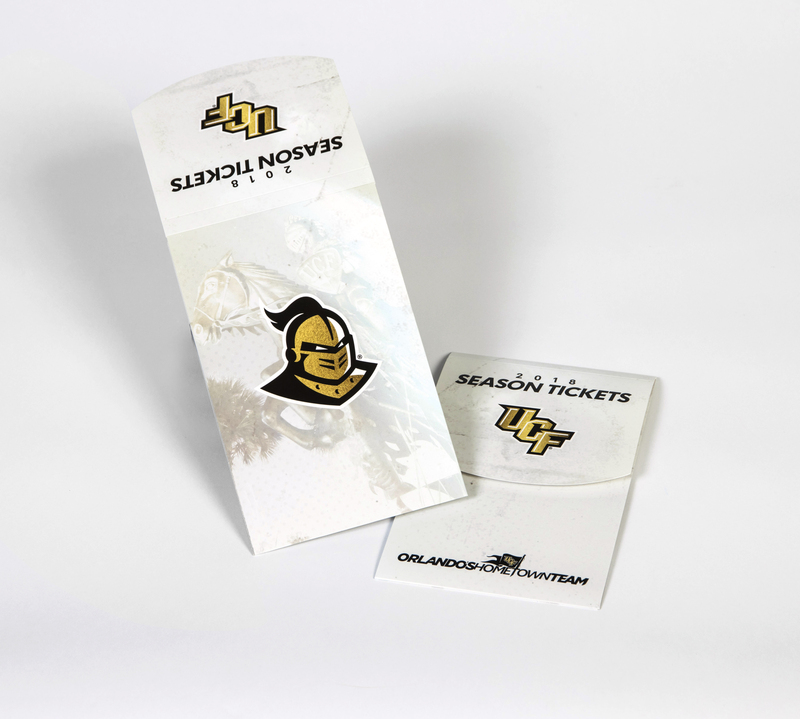 Take advantage of our numerous finishing options including matte, gloss, and soft touch laminations long with many others. 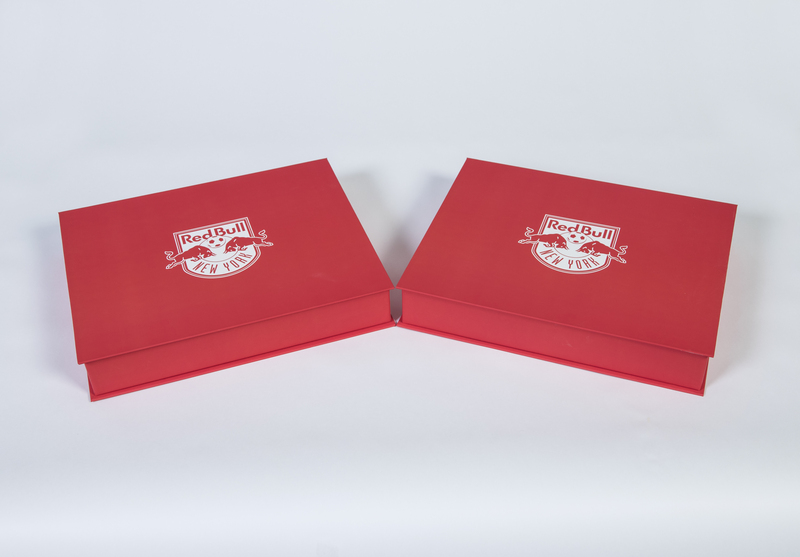 All packaging is printed within our 200,000 square foot eco-friendly facility by our expert press staff. 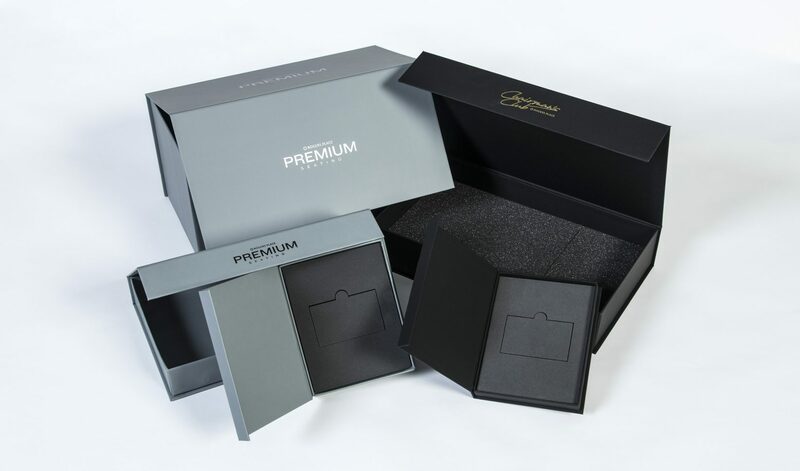 Your quality packaging can be embossed, debossed, spot uv’d, foil stamped, inlaid with metal or a picture, and more – all done in house by Friesens. 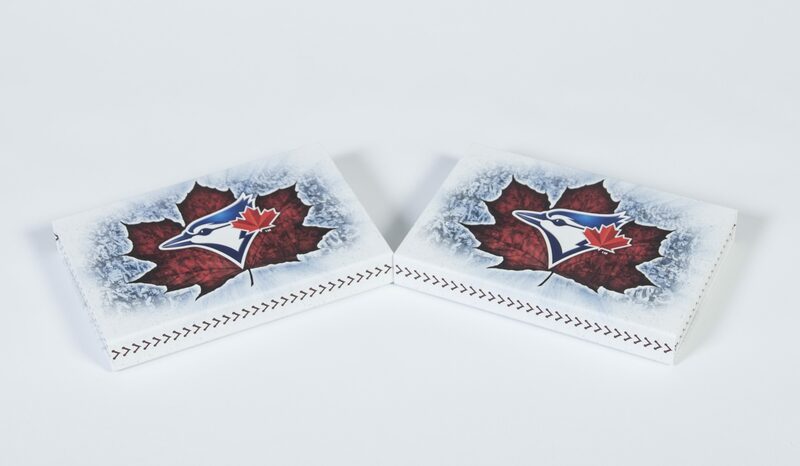 Inside & Outside Material and Finish: Fully printed with a Scuff Resistant Matte Lamination. 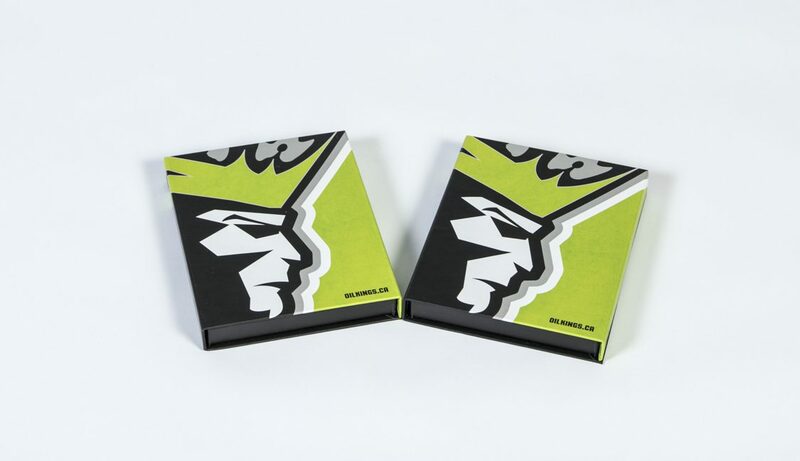 Both boxes have a raised Spot UV finish to bring out that extra shine and added texture. 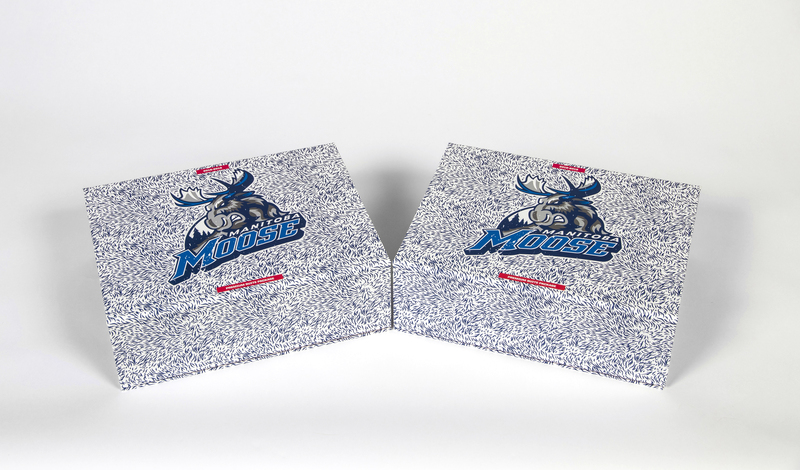 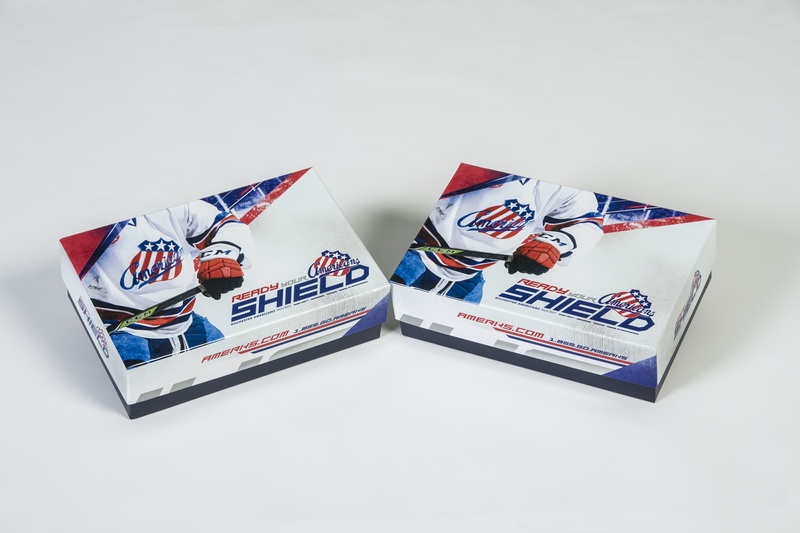 Special Features: The inside of the box has a cover flap with a custom letter to fans along with a printed mask overtop the foam. 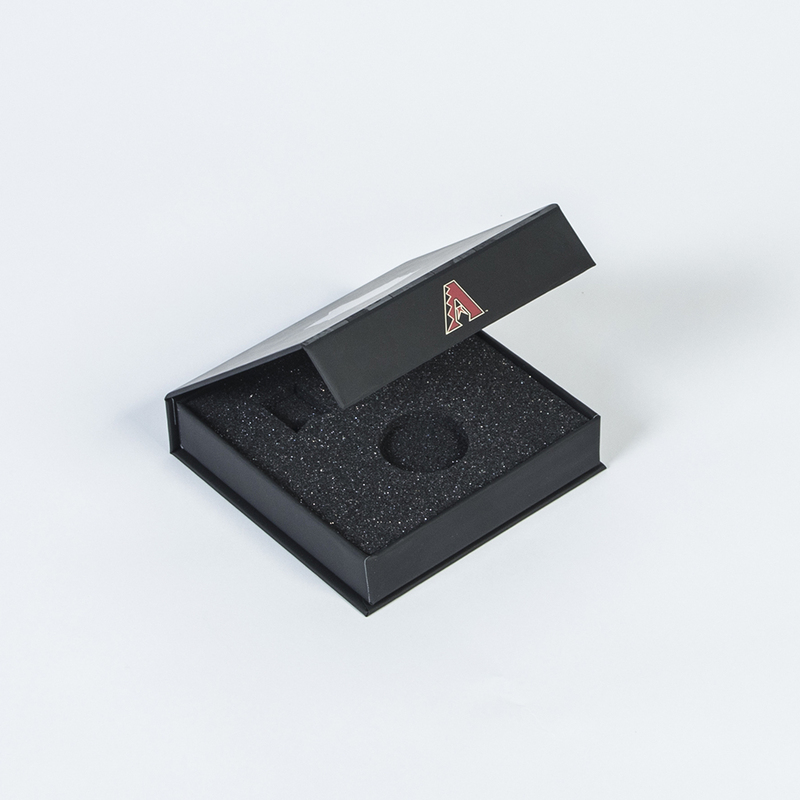 The box itself also has a magnetic closure ensuring a sleek and secure close. 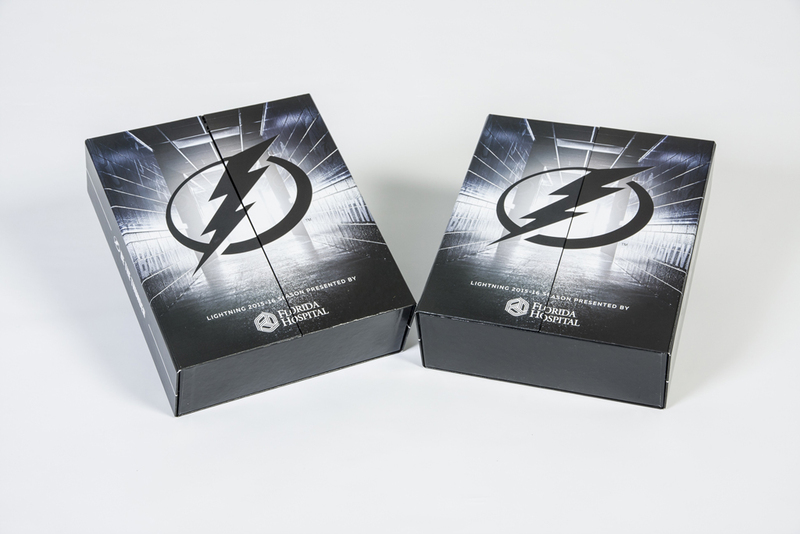 Fulfillment: Friesens sourced & fulfilled all Pucks & Booklets for this project, along with fulfilling each customer’s ticket card in each box – supplying a completely kitted package to the end user. 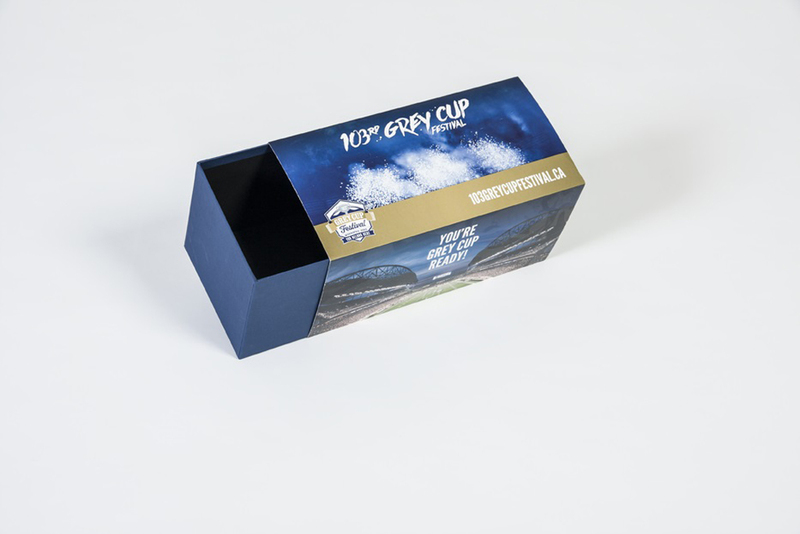 Inside & Outside Material and Finish: Fully printed with an Aqueous Coating for finish. 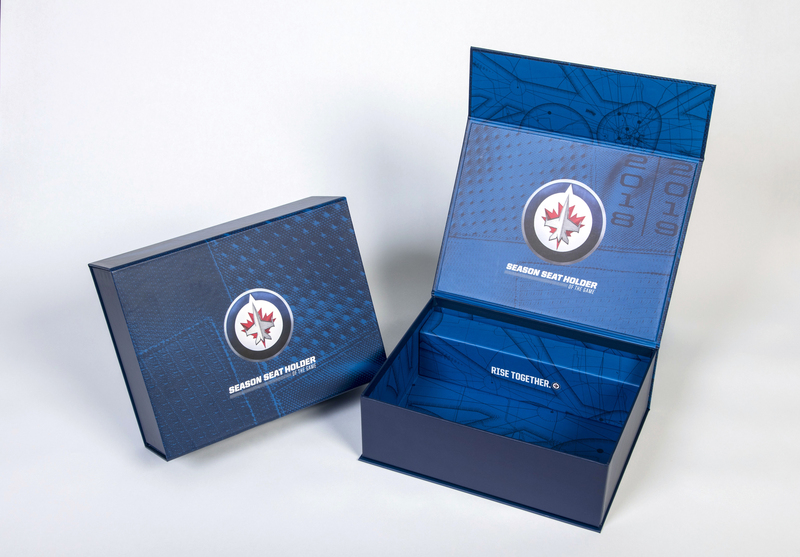 Special Features: The inside of this box has a compartment made of printed paperboard bumpers to give the appearance of a locker room, with doors that close and lock via Velcro. 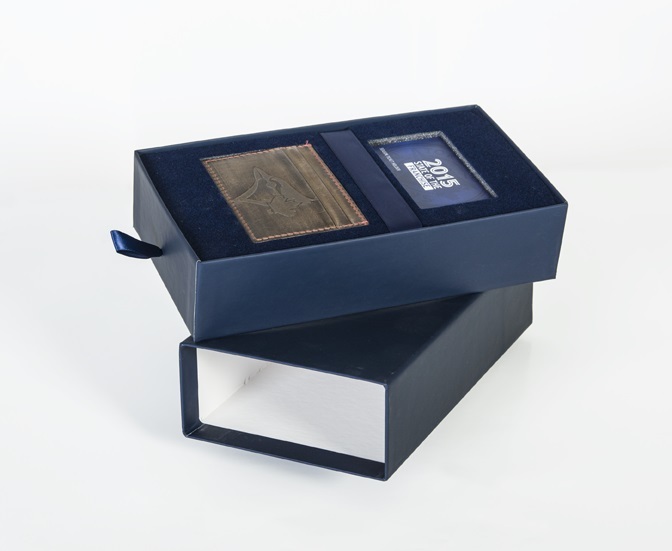 Inside & Outside Material and Finish: Fully printed with scuff free lamination. 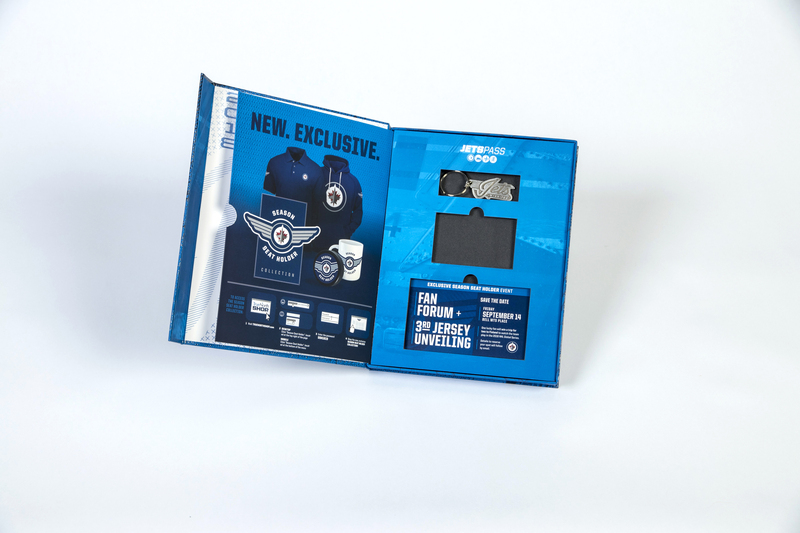 Foam: CF Blue foam with two custom cavities and one plug. 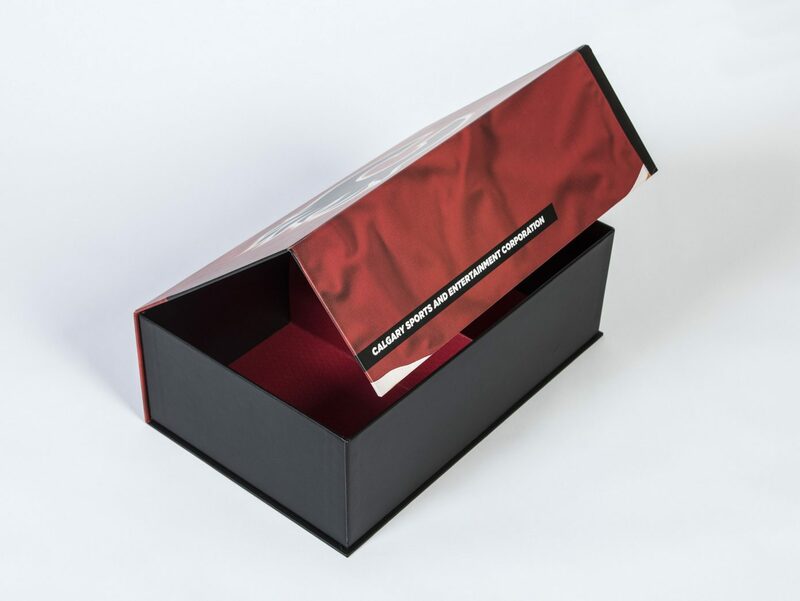 Special Features: The box opens and closes via magnets that lock and close snugly and securely. 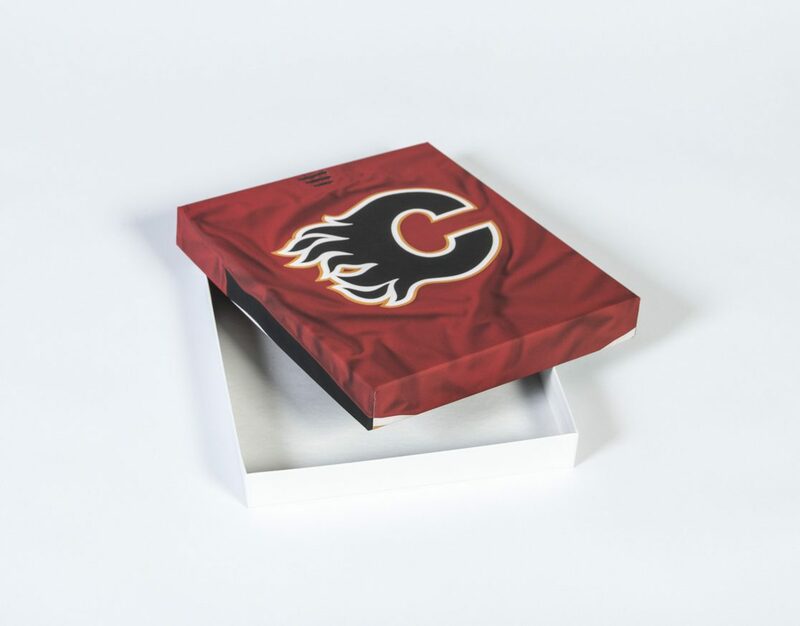 The logo and seams on the outside, as well at the “#Let’sRise” on the inside front cover have been spot UV’d for a crisp and shiny finish. 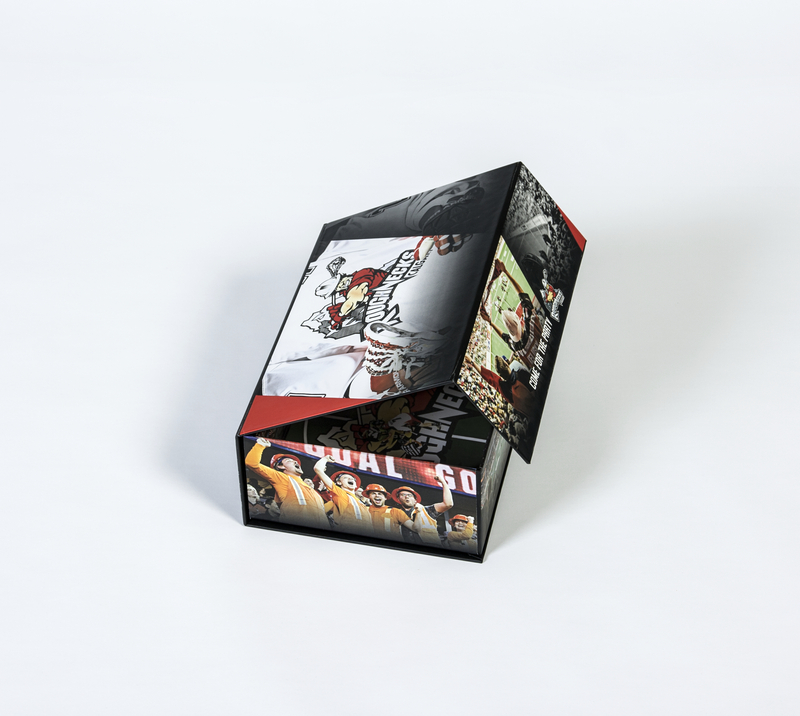 Inside & Outside Material and Finish: Fully printed with matte lamination. 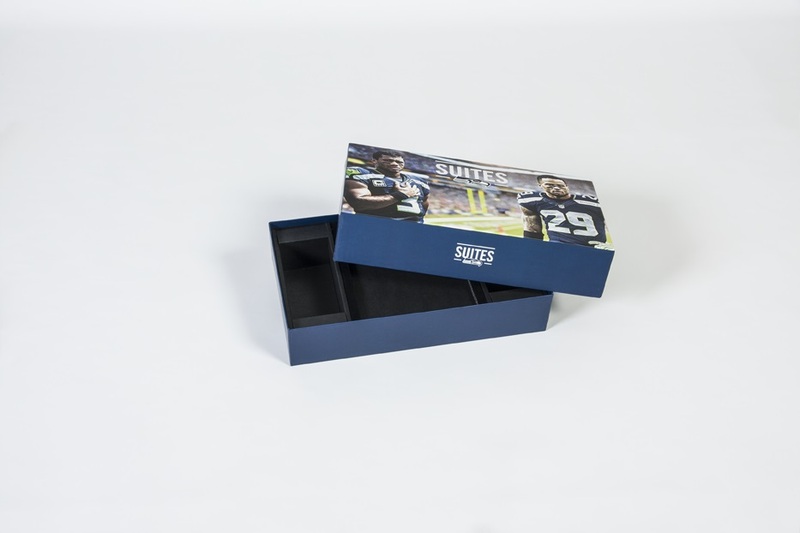 Special Features: The box opens and closes via magnets that lock and close snugly and securely. 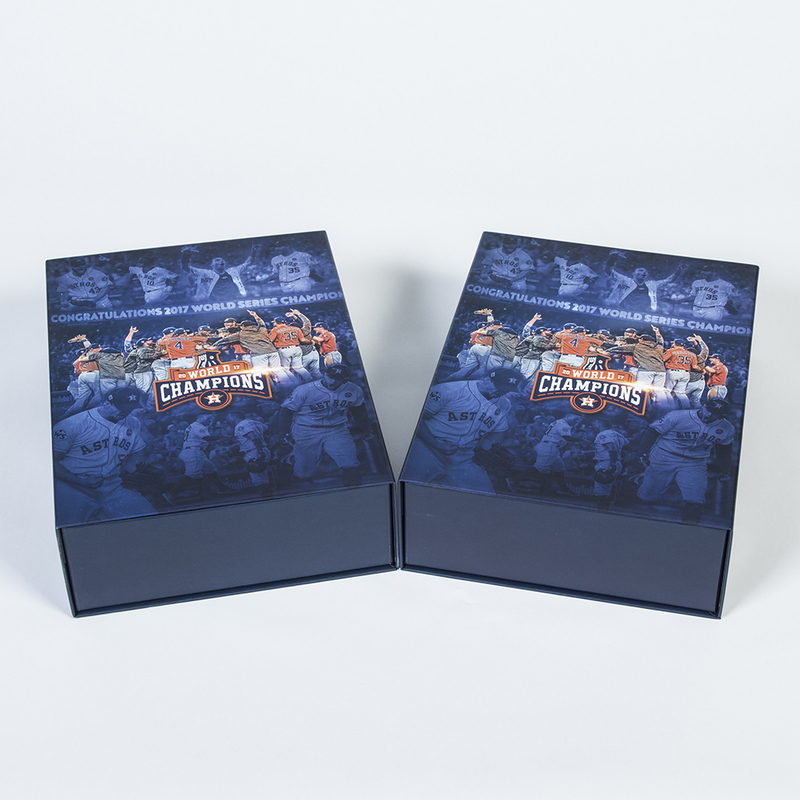 This box is a great way to celebrate being World Champions with your fans! 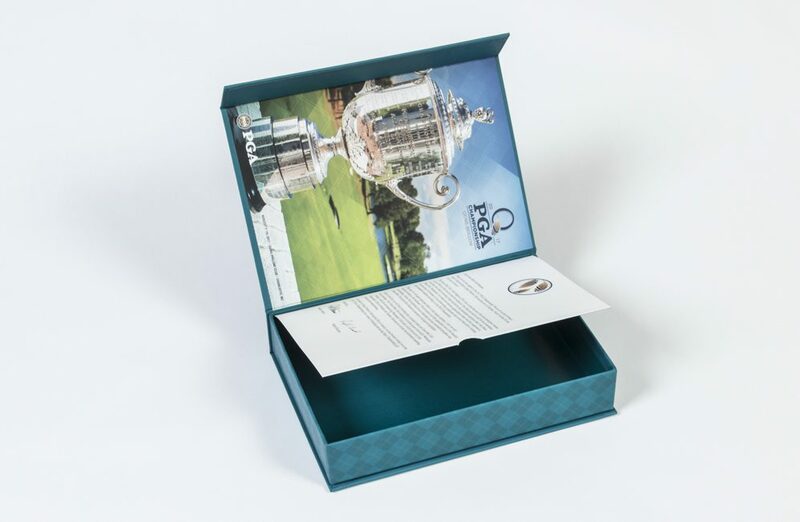 Page Insert: A letter to the fans as a thank you for supporting the 2017 PGA Championship. 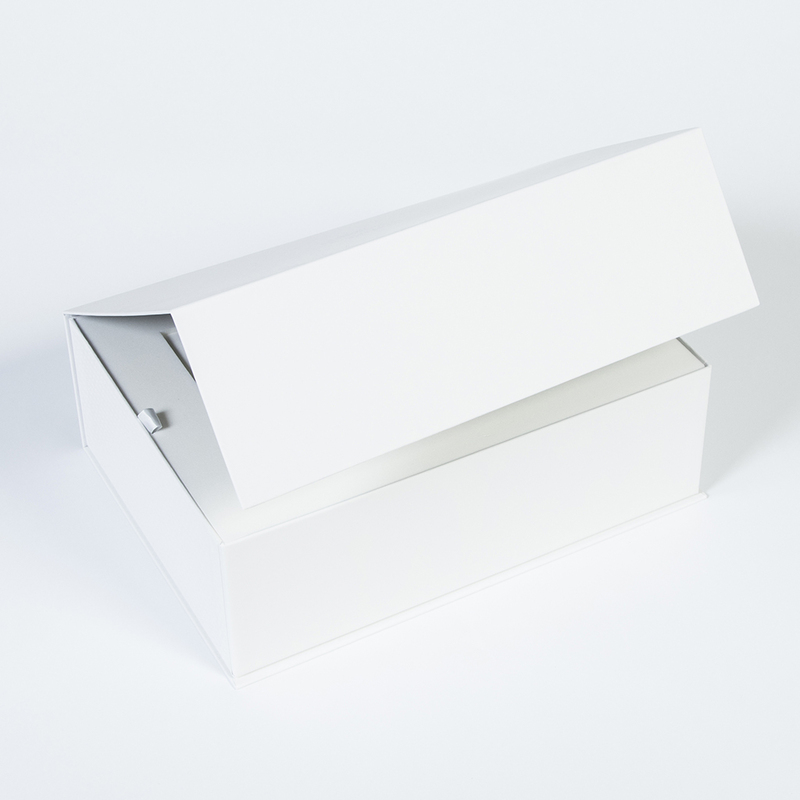 Special Features: The box opens and closes via magnets that lock and close snugly and securely. 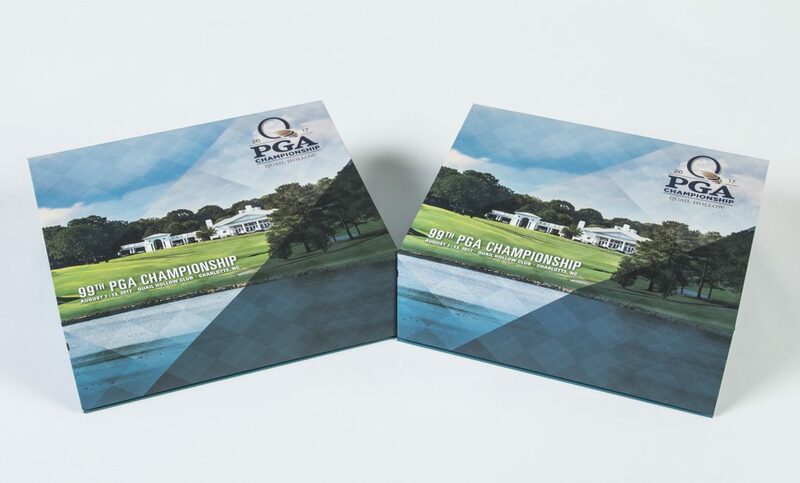 The PGA Championship logo was Spot UV’d on the first box. 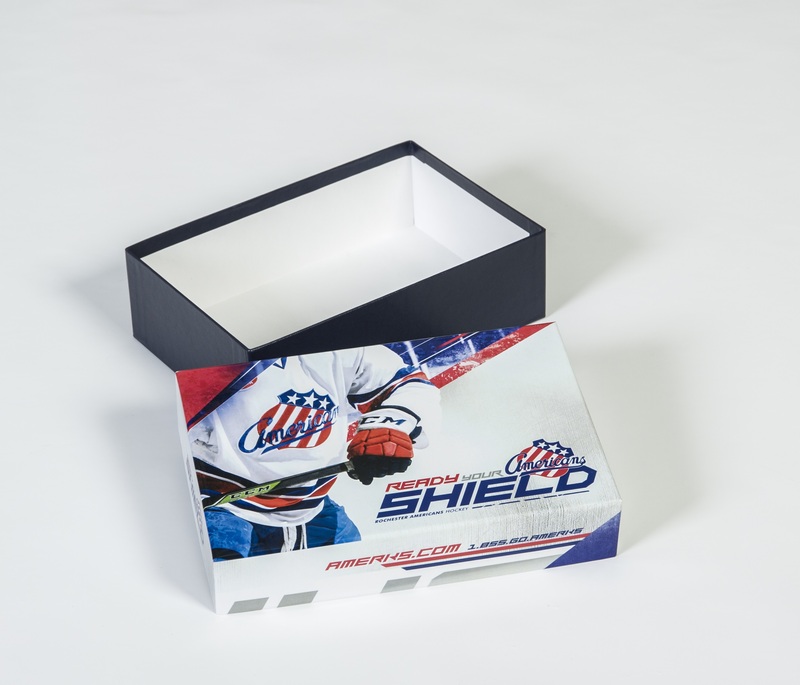 Special Features: The box opens and closes via magnets that lock and close snugly and securely. 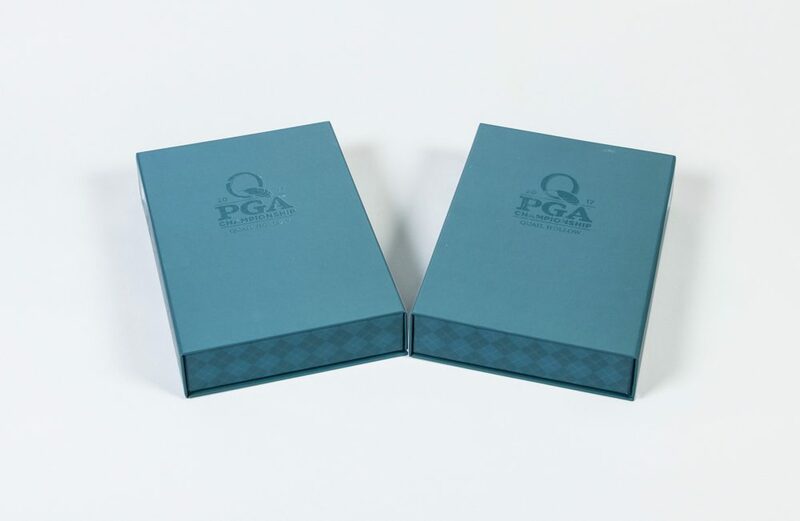 The Honda Classic logo was Spot UV’d on the case wrap. 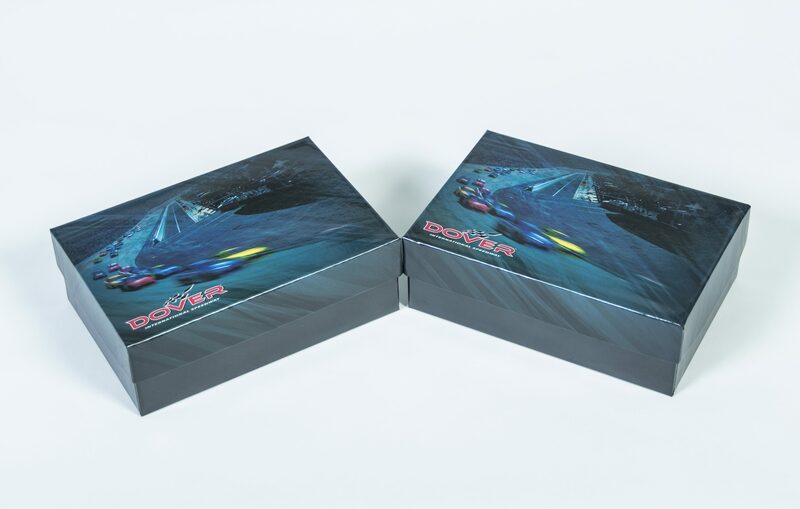 Inside & Outside Material and Finish: Case Wrap printed and the box is finished with scuff free lamination. 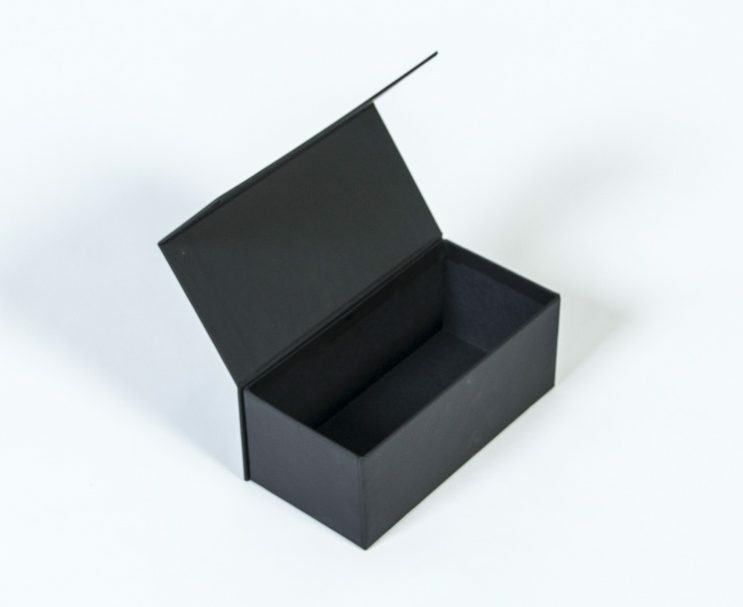 Special Features: The box opens and closes via magnets that lock and close snugly and securely. 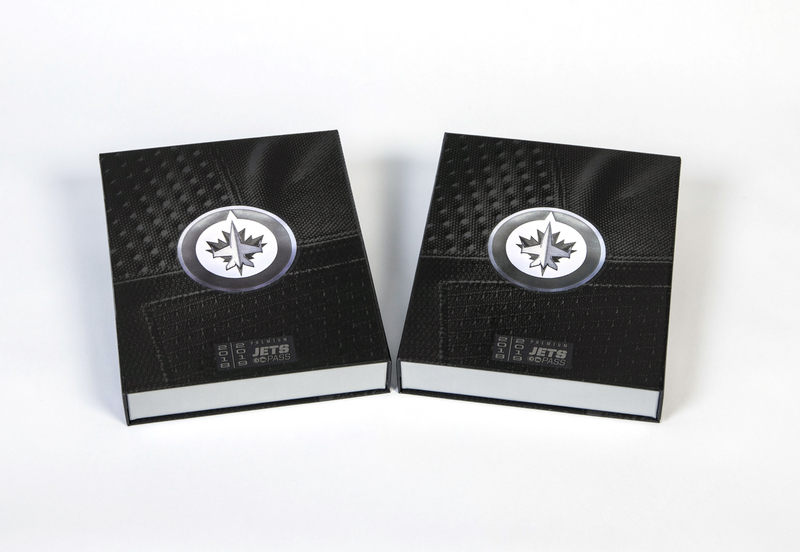 The AT&T Byron Nelson logo was Spot UV’d on the case wrap, as well as a golf ball pattern and skyline on the base wrap. 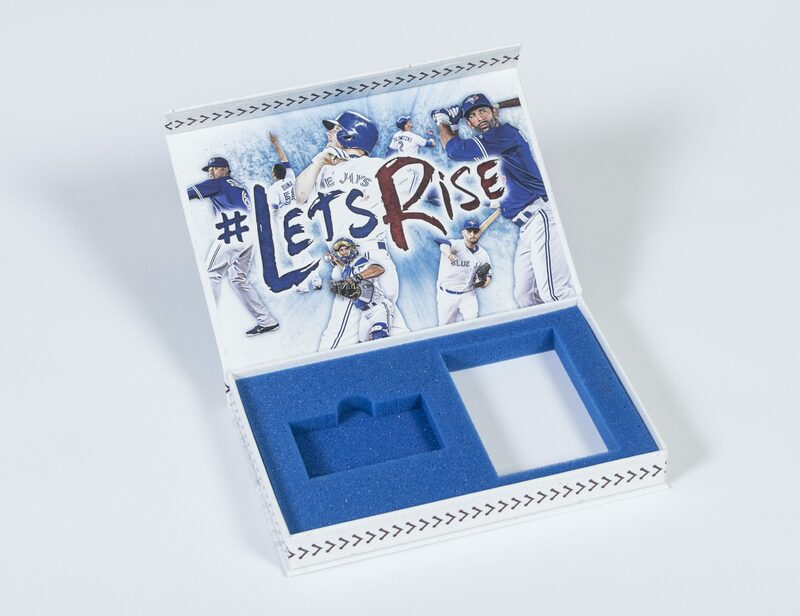 Platform insert with foam on top to show off a letter to the fans and the tickets. 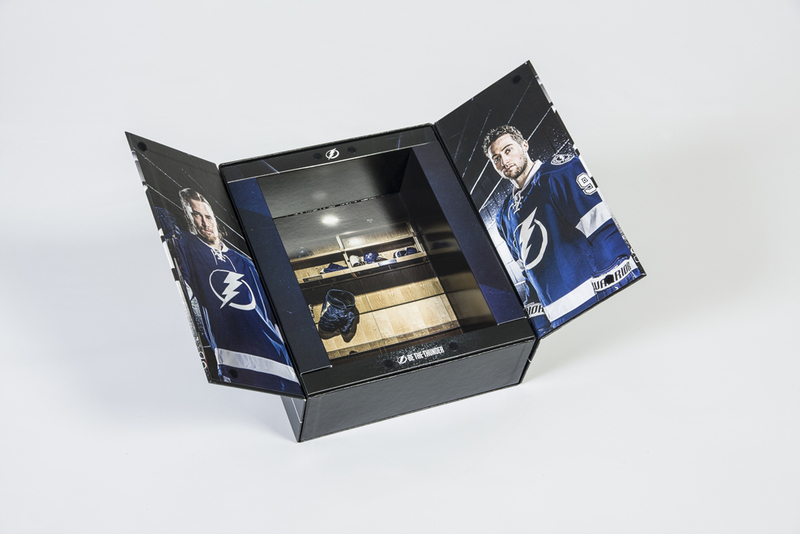 Inside & Outside Material and Finish: Fully printed with a matte lamination for finish. 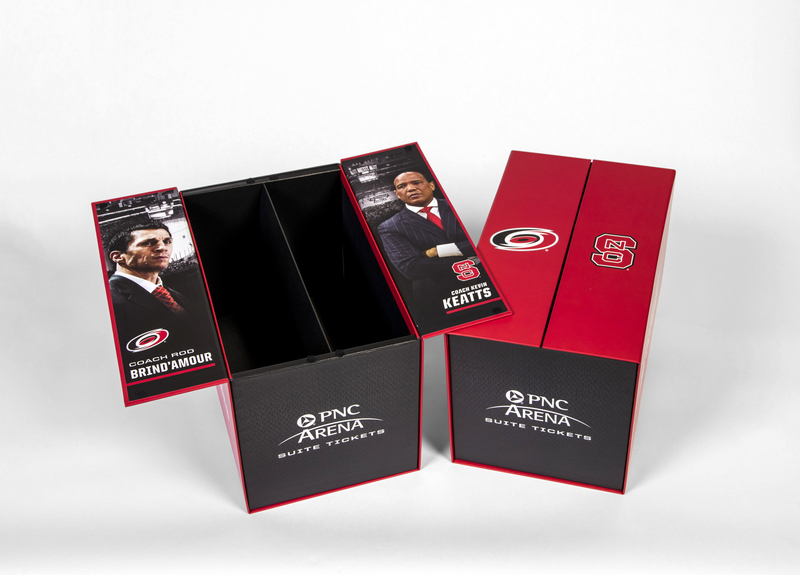 Special Features: The inside of this box has a paperboard insert to create two cavities to perfectly hold envelopes filled with tickets for Hurricanes and Wolfpack suites, with doors that close and lock via Velcro. 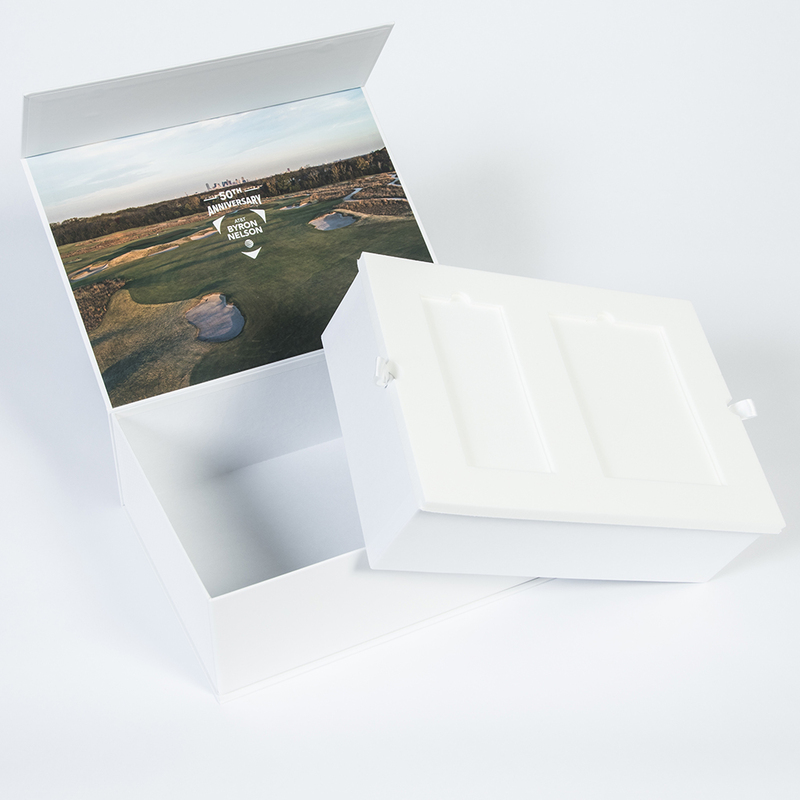 Inside & Outside Material and Finish: Fully printed throughout and Aqueous Coated. 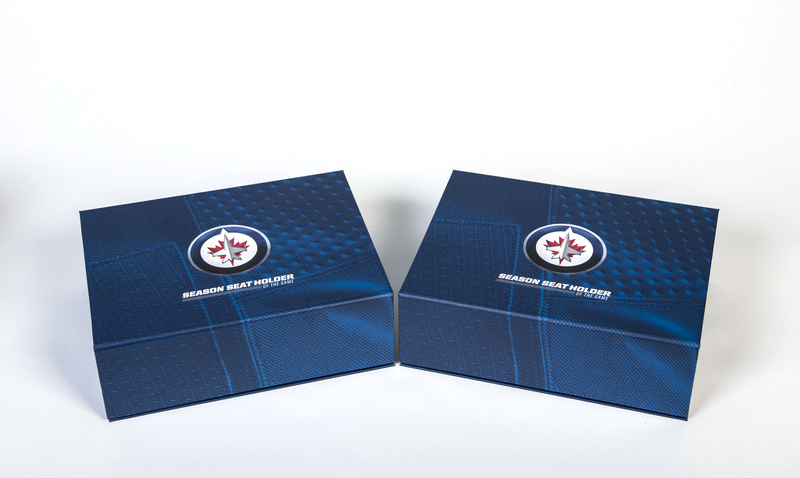 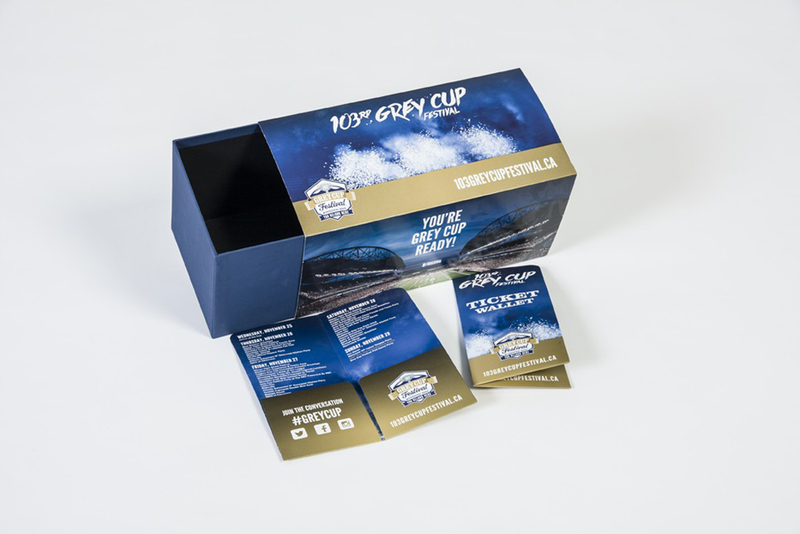 Special Features: We are proud to have been chosen to work on the packaging for the Grey Cup. 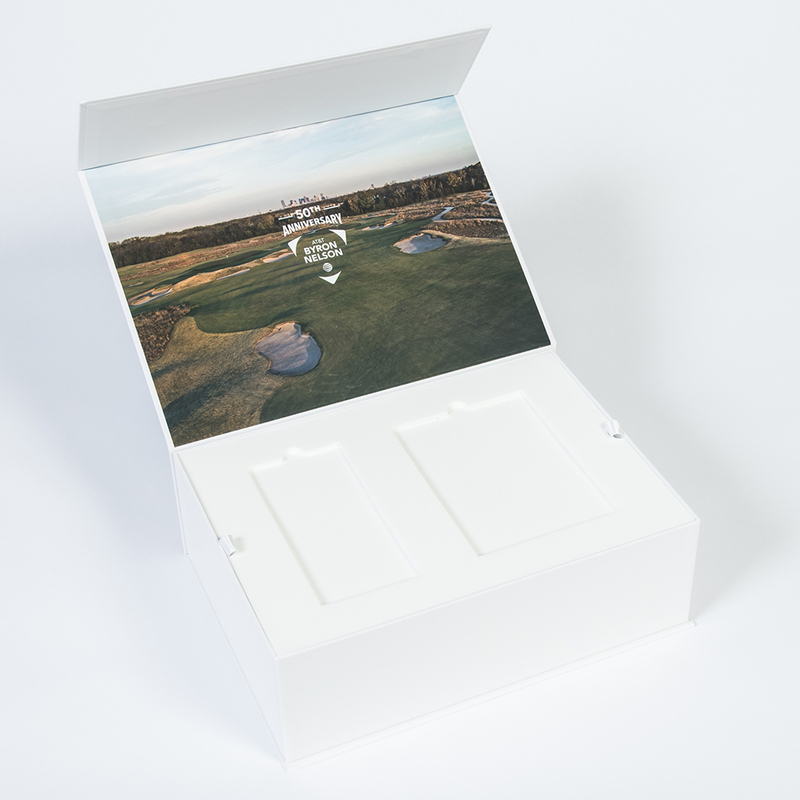 This project involved us supplying custom ticket wallets, tickets, and slide boxes for the events. 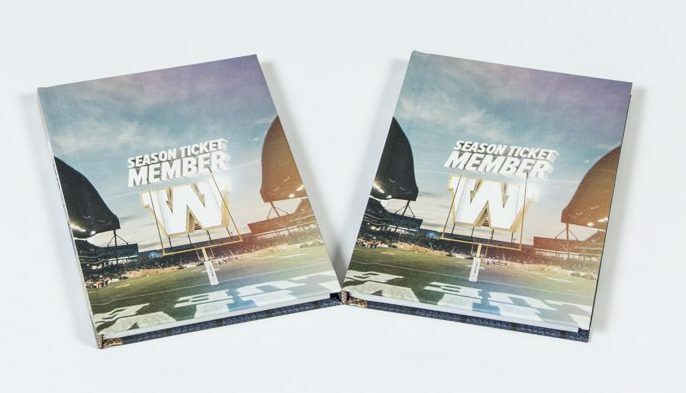 Inside & Outside Material and Finish: Fully printed with a Matte Lamination. 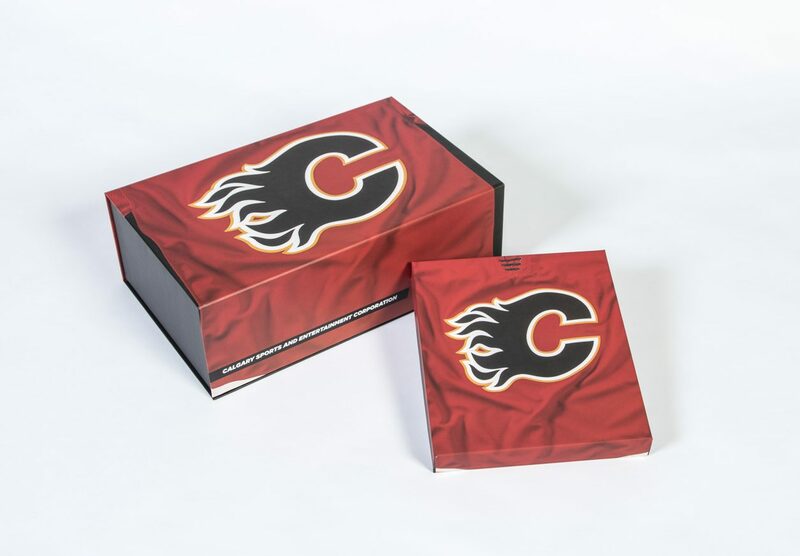 Special Features: Bumper inserts to match the jersey look created on the inside and outside of the box, as well as finished with a magnetic close that is sleek and secure. 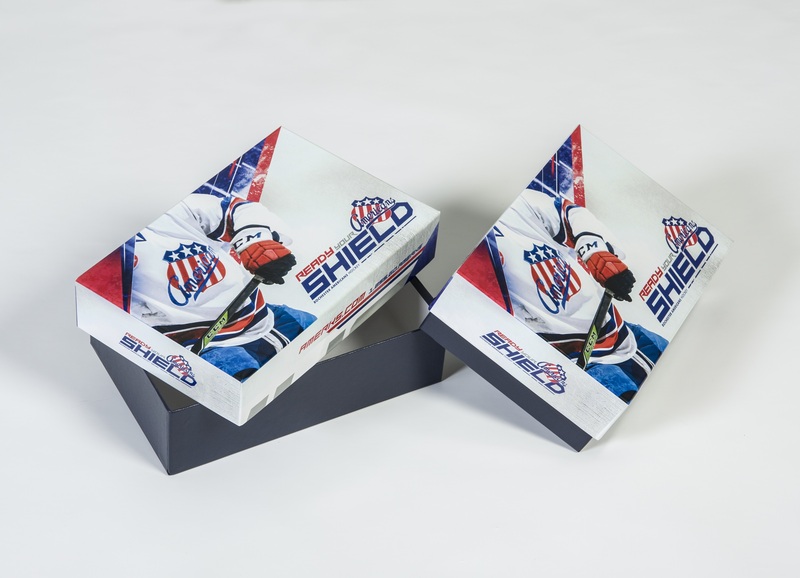 Inside & Outside Material and Finish: Fully printed lid and base with Scuff Resistant Matte Lamination. 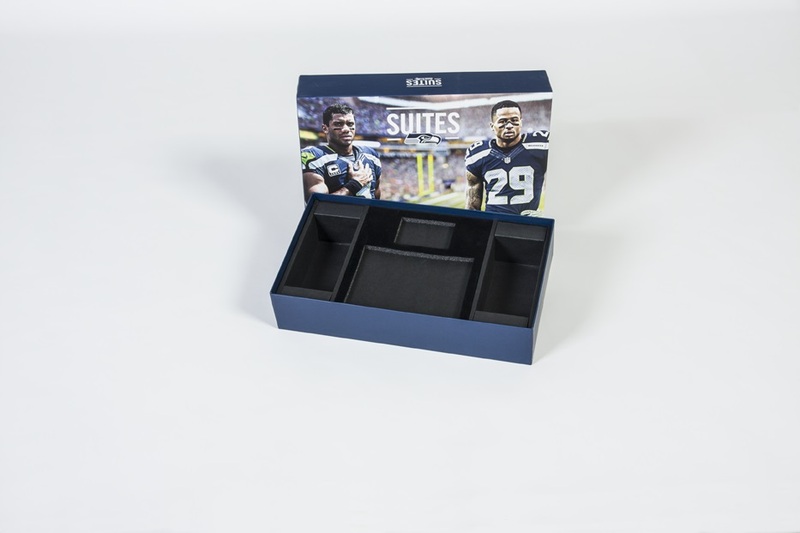 Special Features: Box designed to match the Premium Suite Package to perfectly complete the set. 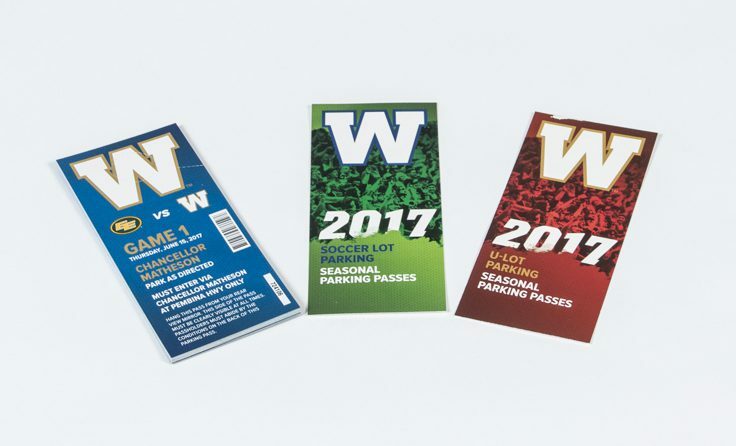 Inside & Outside Material and Finish: Fully printed throughout and finished with matte lamination. 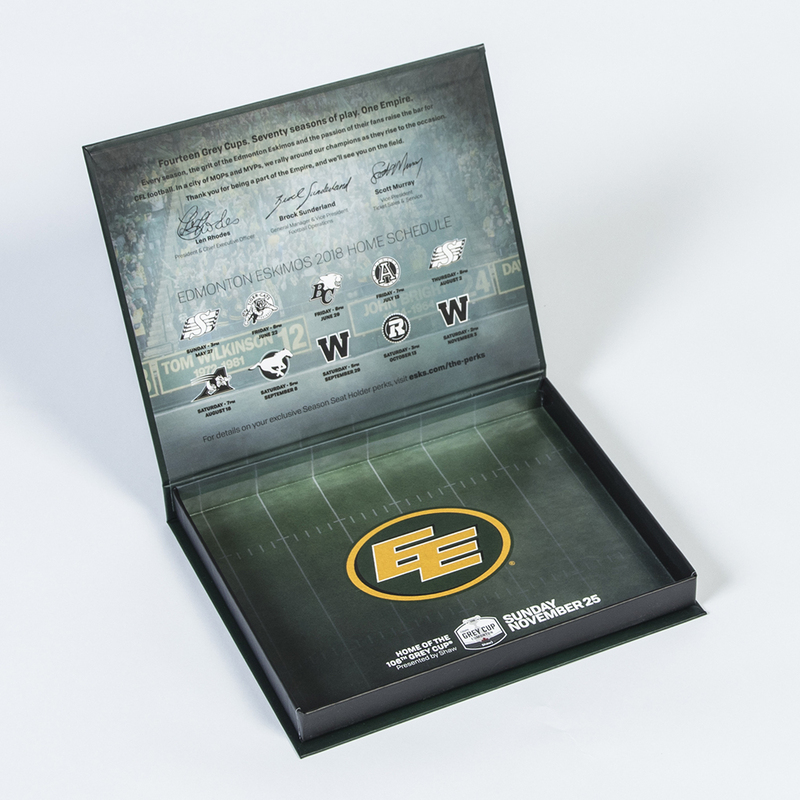 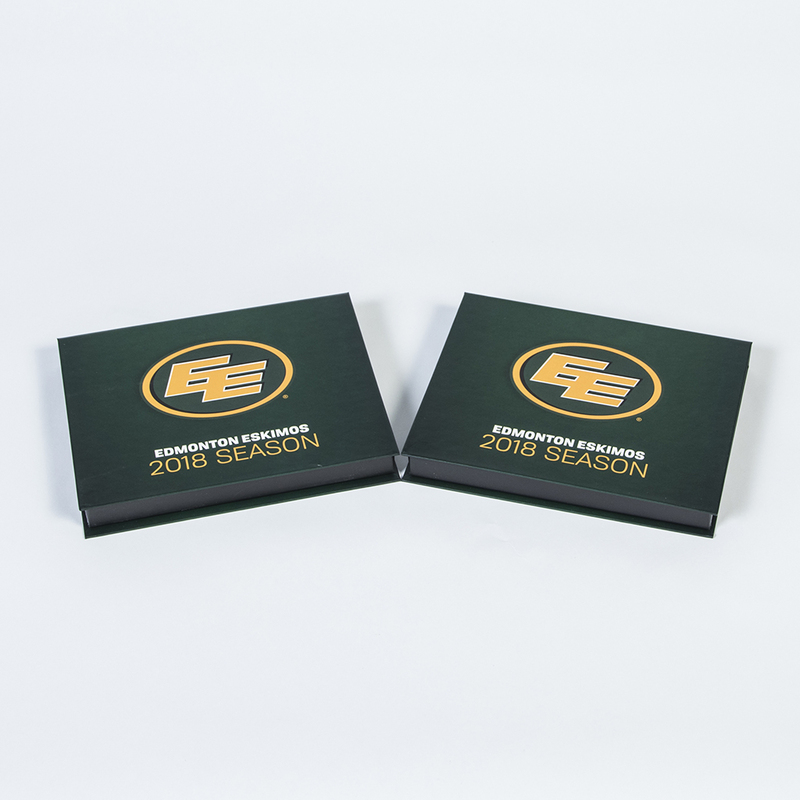 Special Features: The box features a special message to fans as the Eskimos host the 2018 Grey Cup. 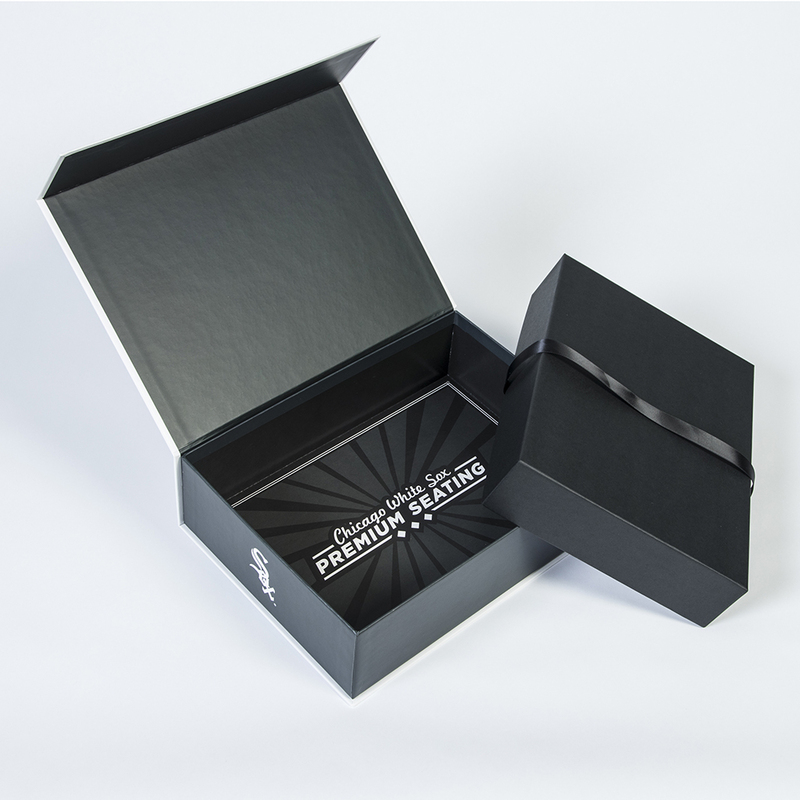 Special Features: The box features a magnetic closure ensuring a sleek and secure close. 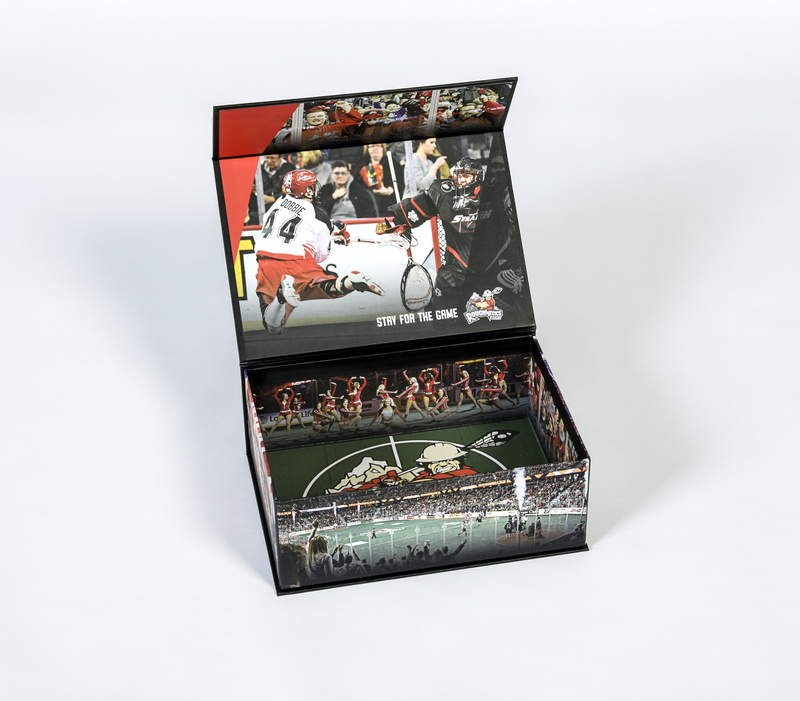 Inside & Outside Material and Finish: Fully printed throughout and finished with Scuff Resistant Matte Lamination. 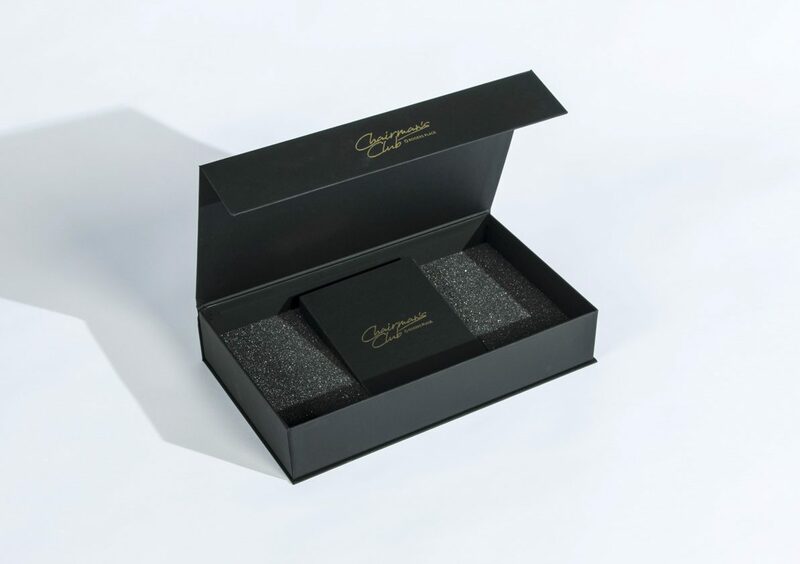 Special Features: The boxes feature a magnetic closure ensuring a sleek and secure close. 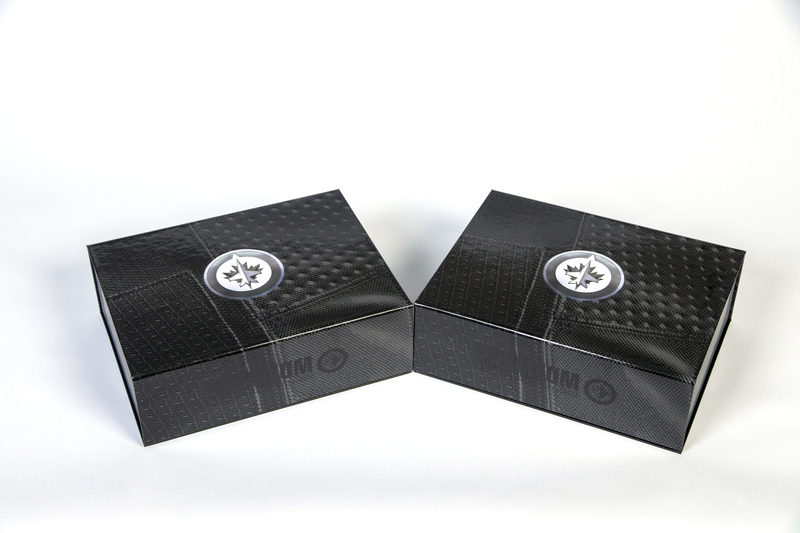 The logos on the outside have been foil stamped in gloss black to give a nice contrast. 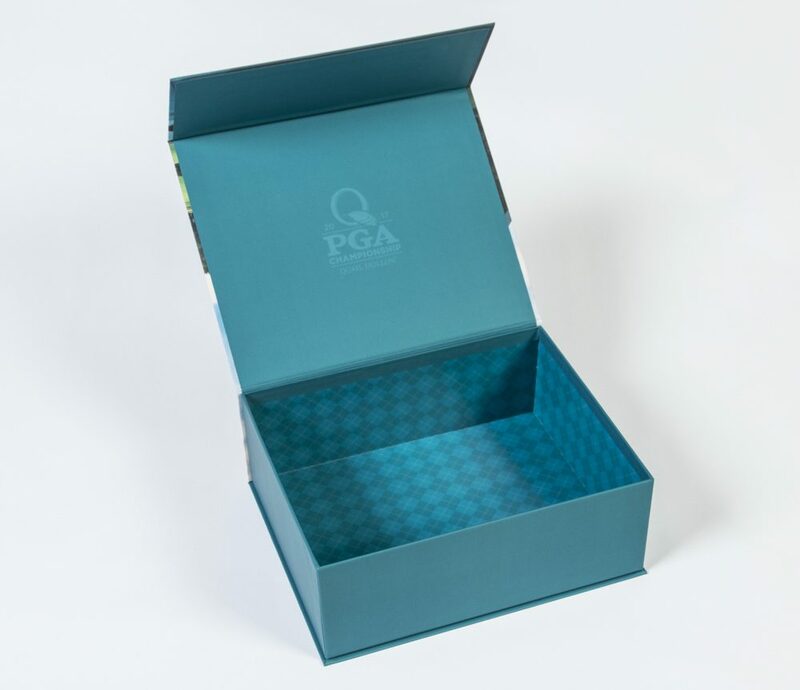 Inside & Outside Material and Finish: Fully wrapped in a dyed-through kraft known for its soft-touch finish. 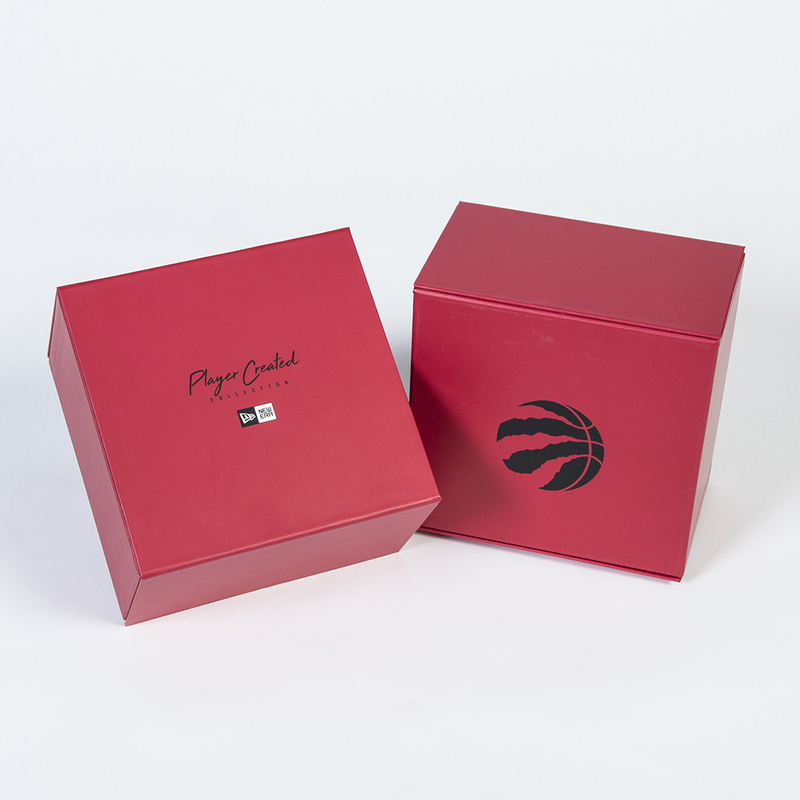 Special Features: The box features a magnetic closure ensuring a sleek and secure close. 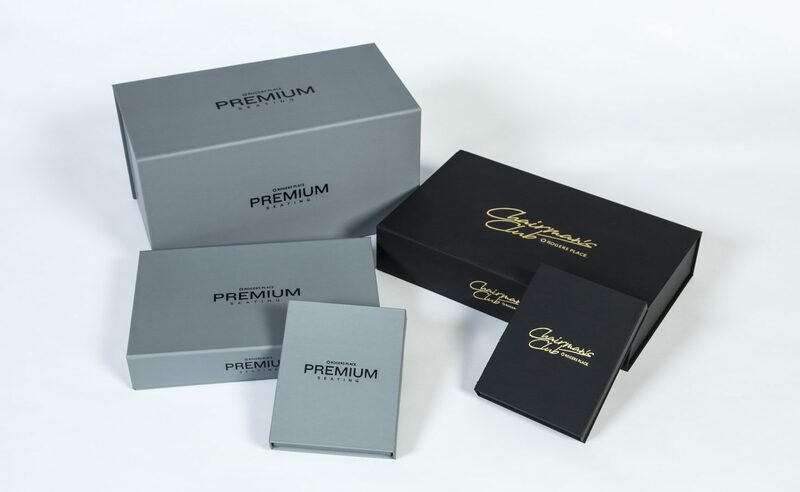 The logos on the outside have been foil stamped in shiny gold to give the box a high class, premium look and feel. 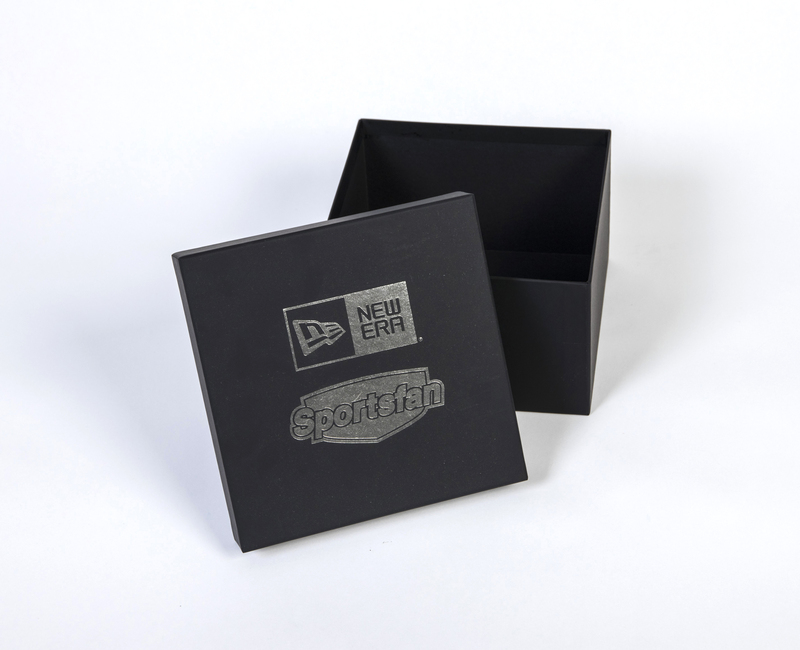 Inside & Outside Material and Finish: Black soft touch material with foil stamping on the lid. 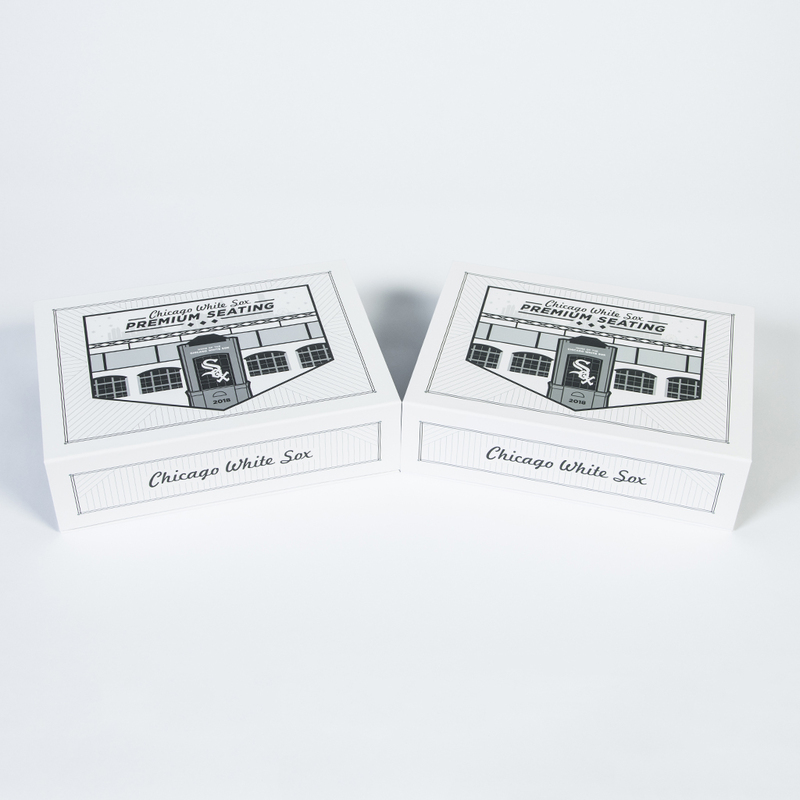 Black board inside. 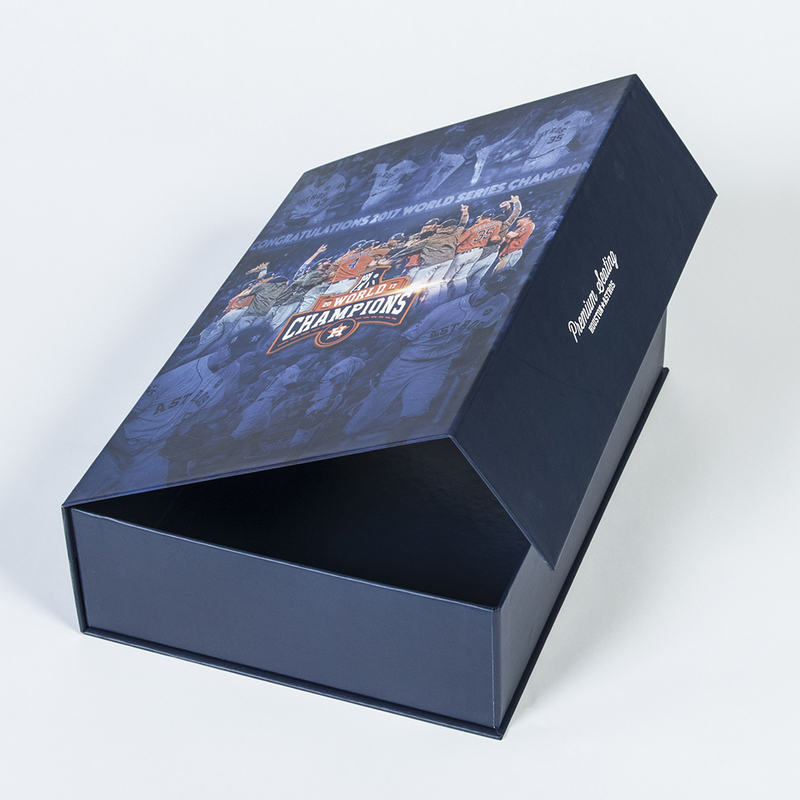 Special Features: The box was designed to fit a New Era Cap perfectly to provide a strong presentation. 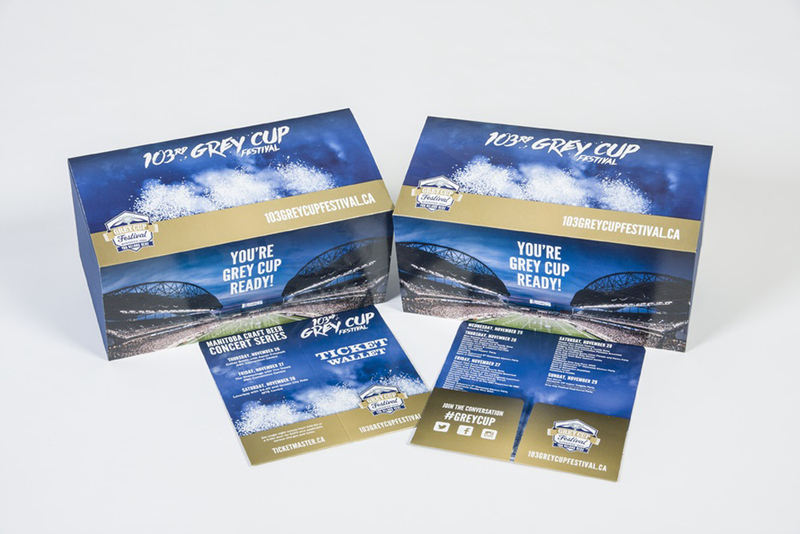 Inside & Outside Material and Finish: Fully printed with a gloss lamination. 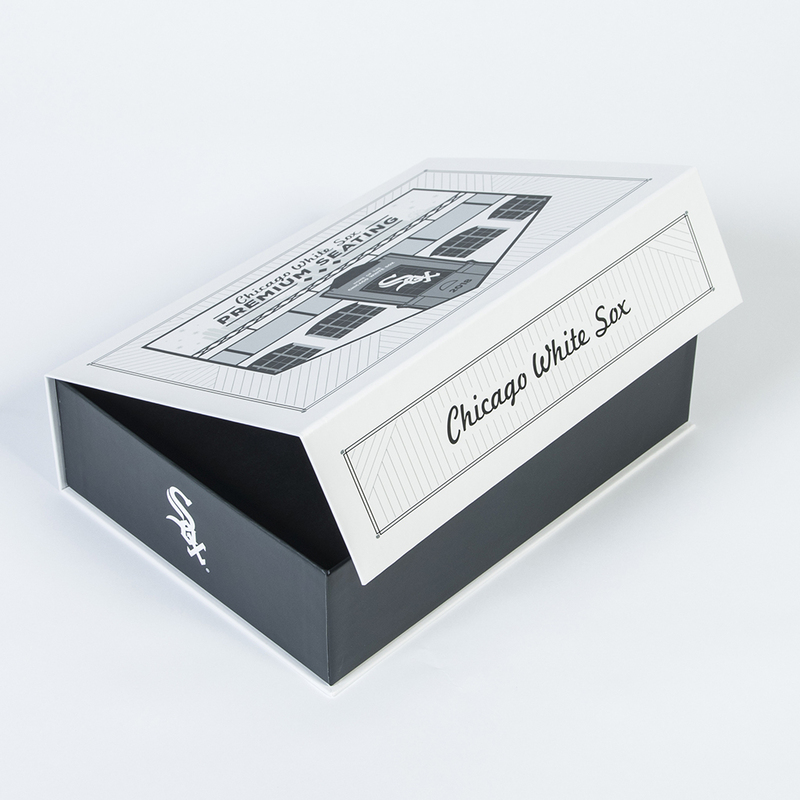 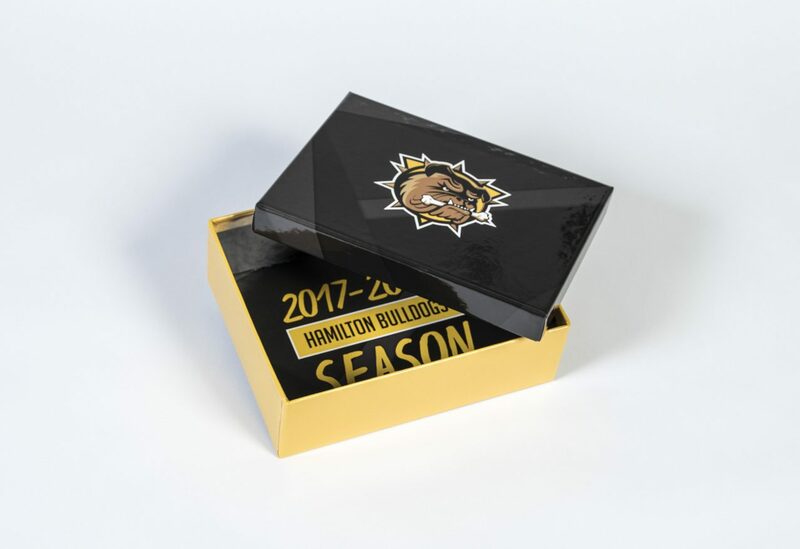 Special Features: The season ticket box housed tickets, pennants, programs, and other items that the season ticket holders received. 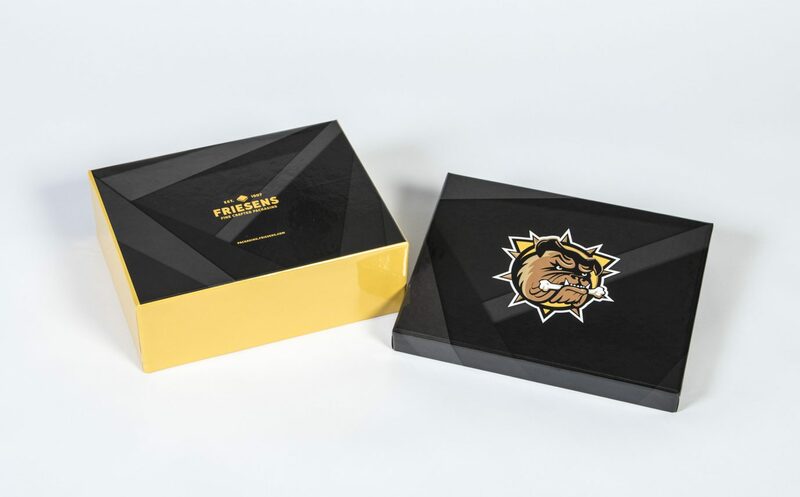 The box also featured the Friesens Packaging logo on the bottom of the box. 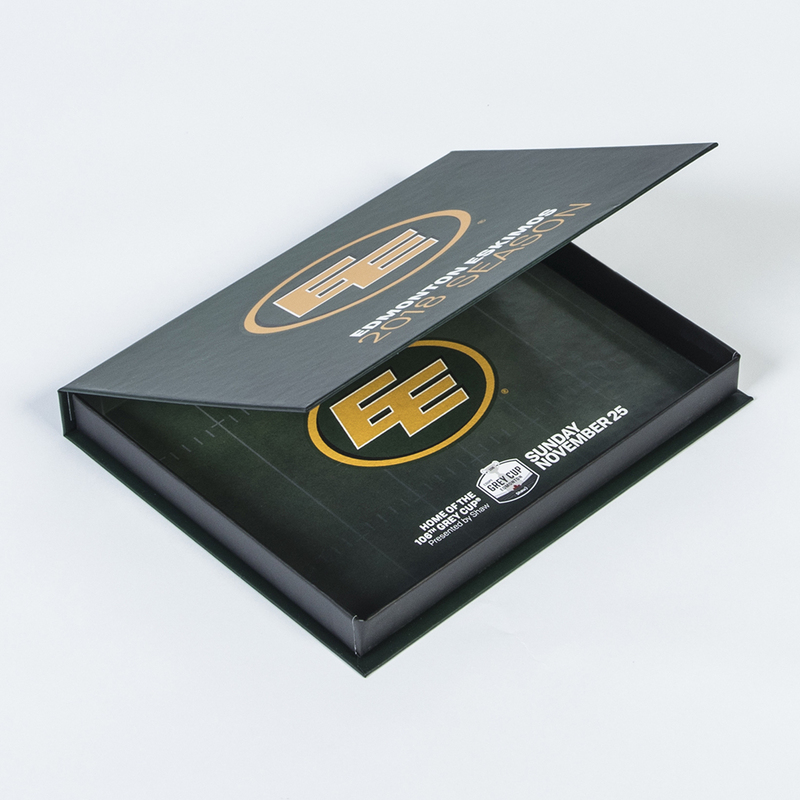 Inside & Outside Material and Finish: Fully printed with a Soft Touch Lamination. 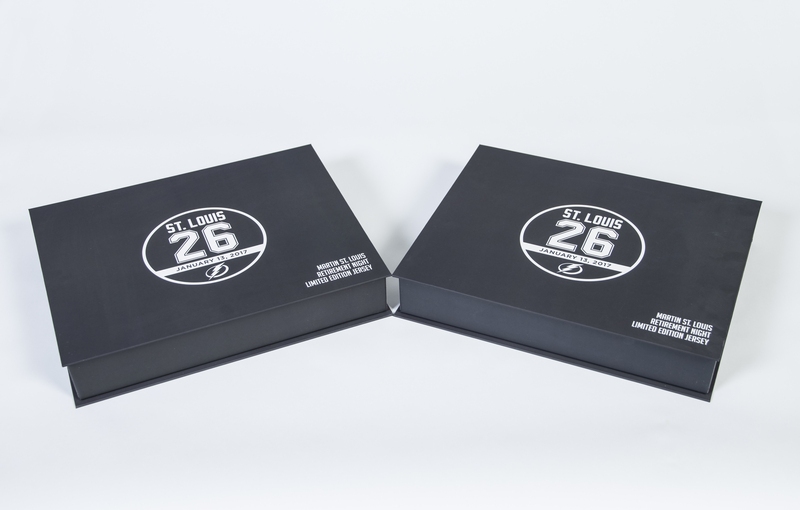 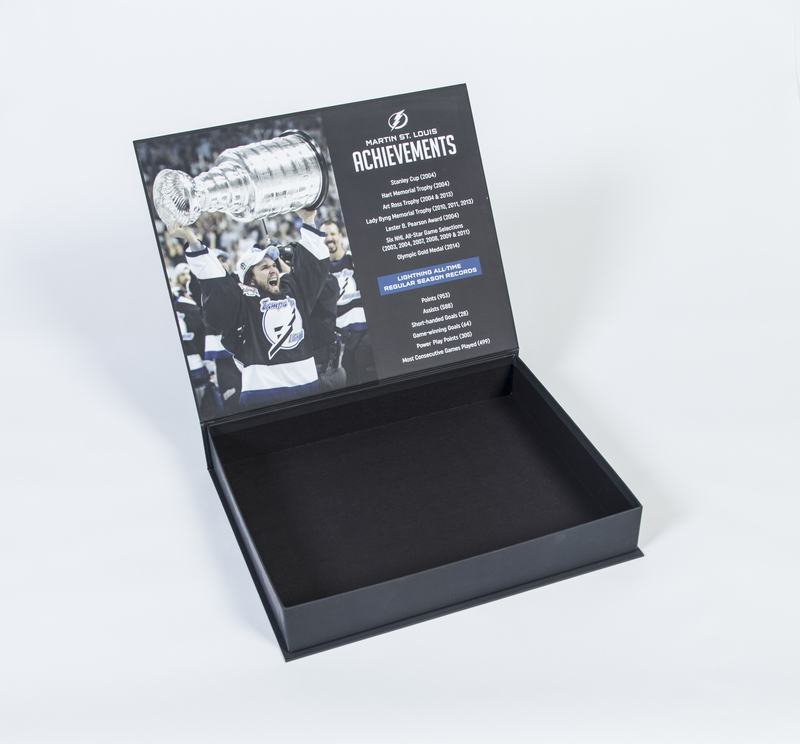 Special Features: This box features black board on the inside tray, as well as Martin St. Louis’ career stats on the inside front cover. 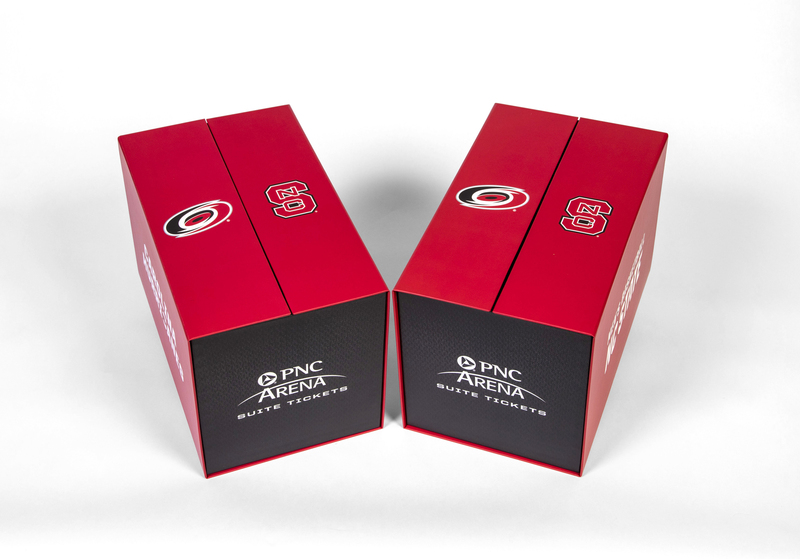 A nice touch for a very special event. 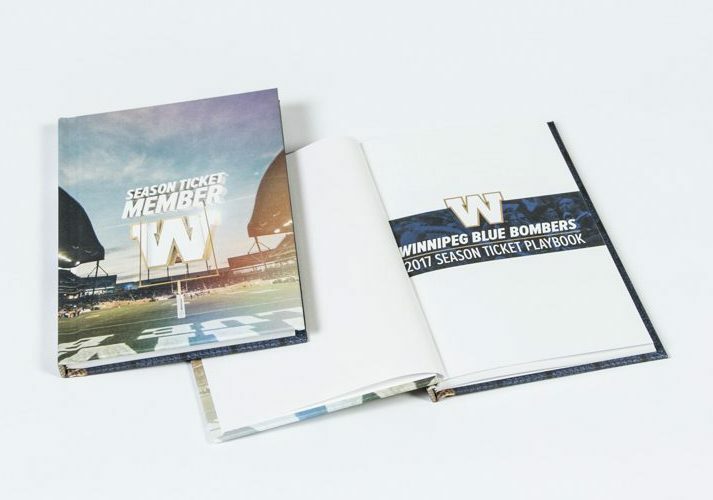 Inside & Outside Material and Finish: Fully printed with matte lamination including a special message to the fans on the inside. 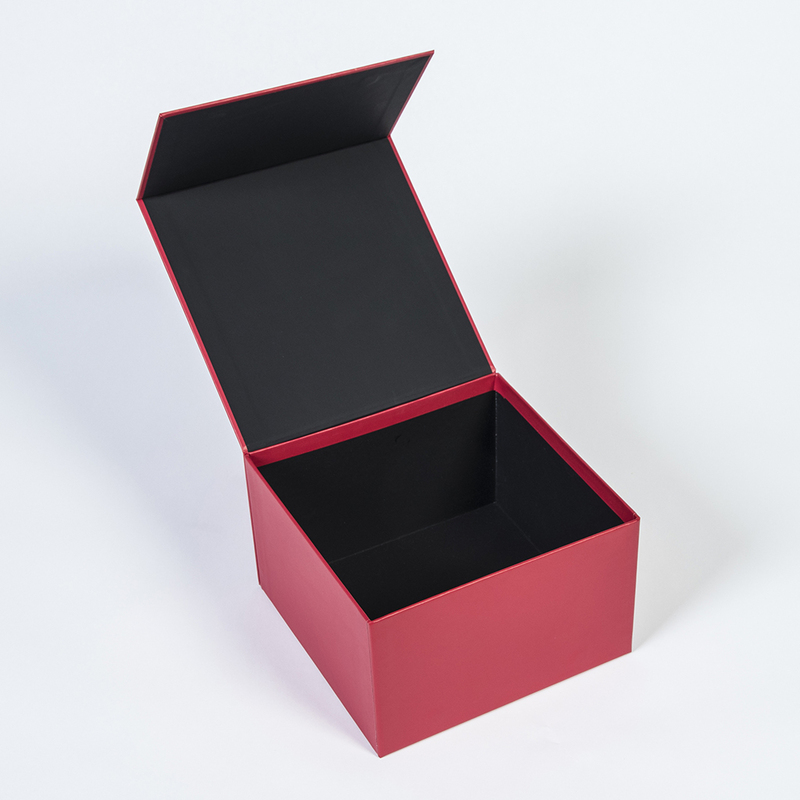 Special Features: The box opens and closes via magnets that lock and close snugly and securely. 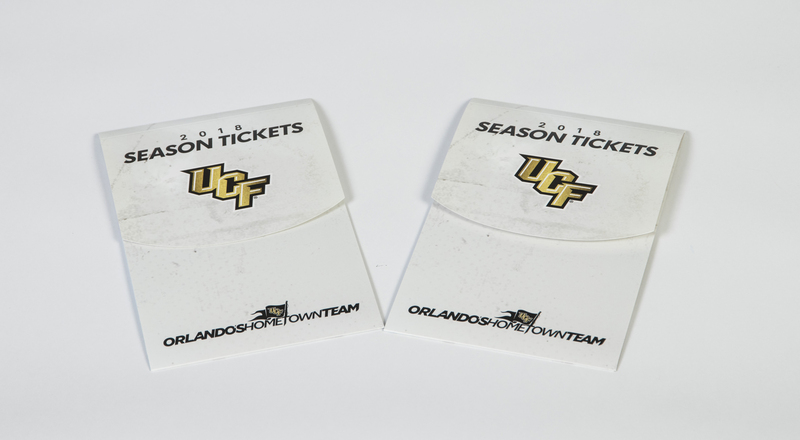 Special Features: The inside of the box features a platform and ribbon to raise the ticket books up and keep them in place. 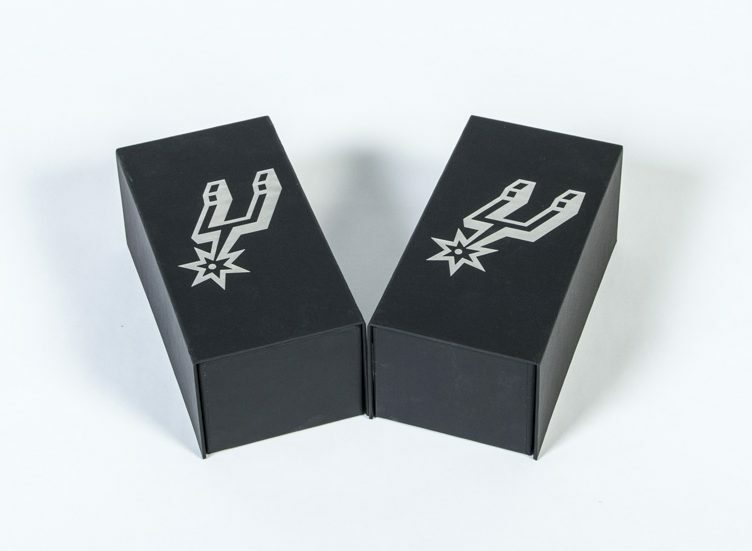 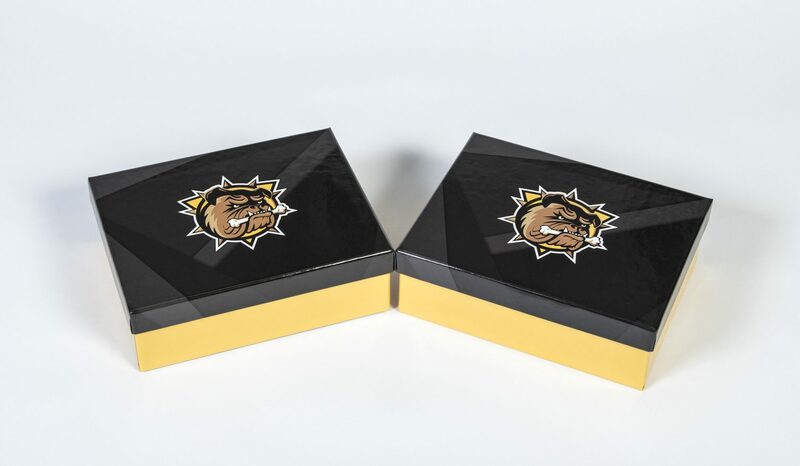 Special Features: The smaller box features Spot UV on the case wrap and CF Black foam on the inside to hold commemorative pins and a coin. 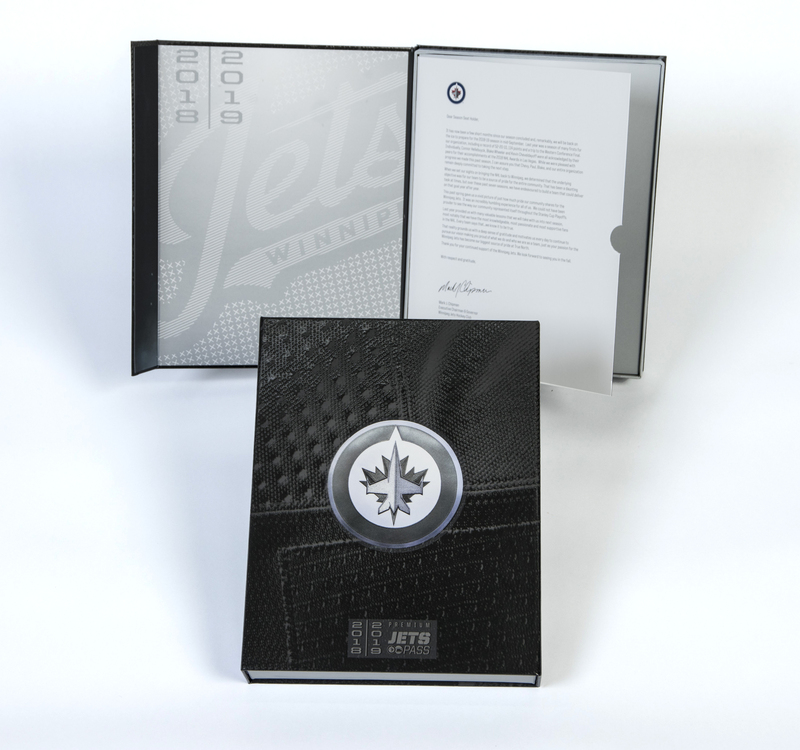 Inside & Outside Material and Finish: Black soft touch material with foil stamping on the outside cover. 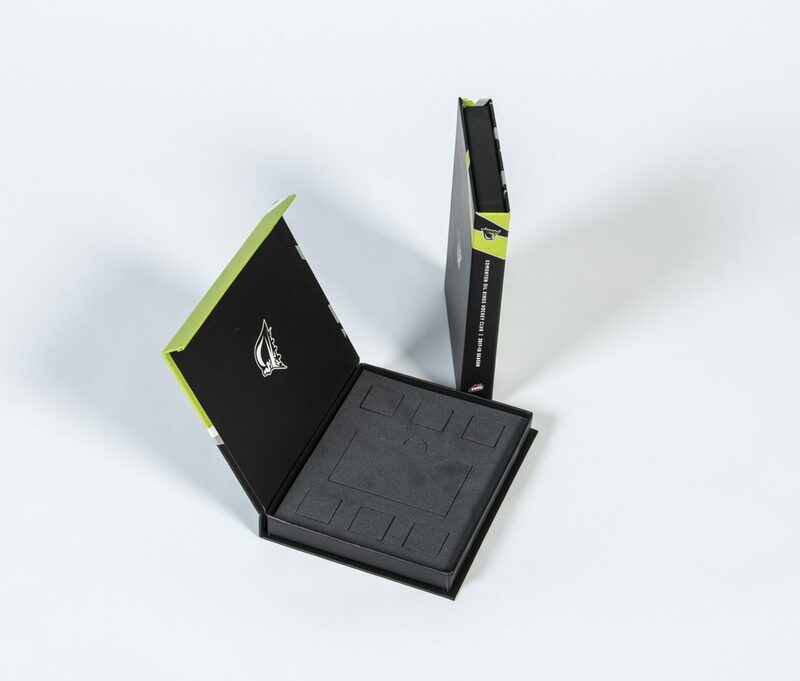 Black board inside. 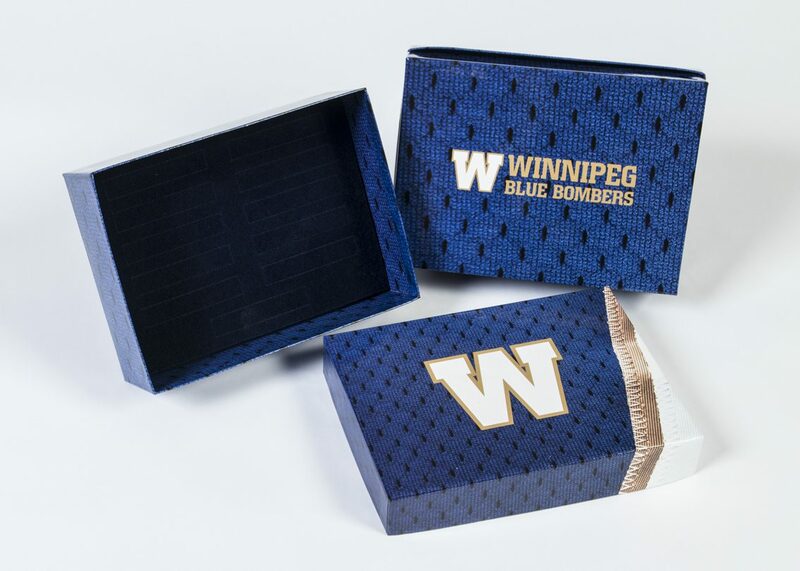 Foam: CF black foam with navy blue flocking. 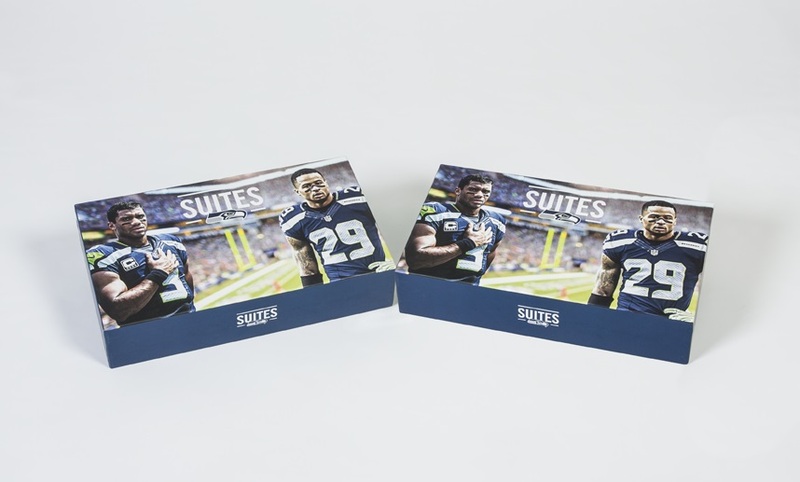 Special Features: The suite boxes were outfitted with custom sized foam to fit their cards and collateral. 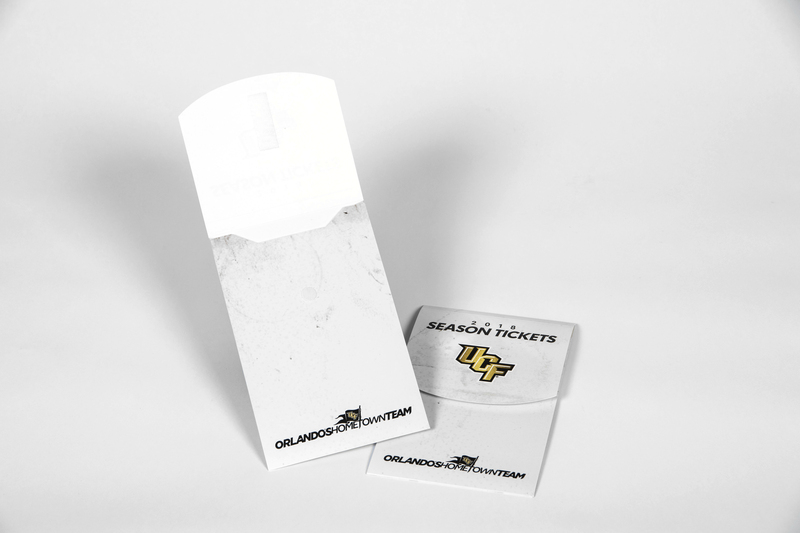 We also printed parking passes for this job. 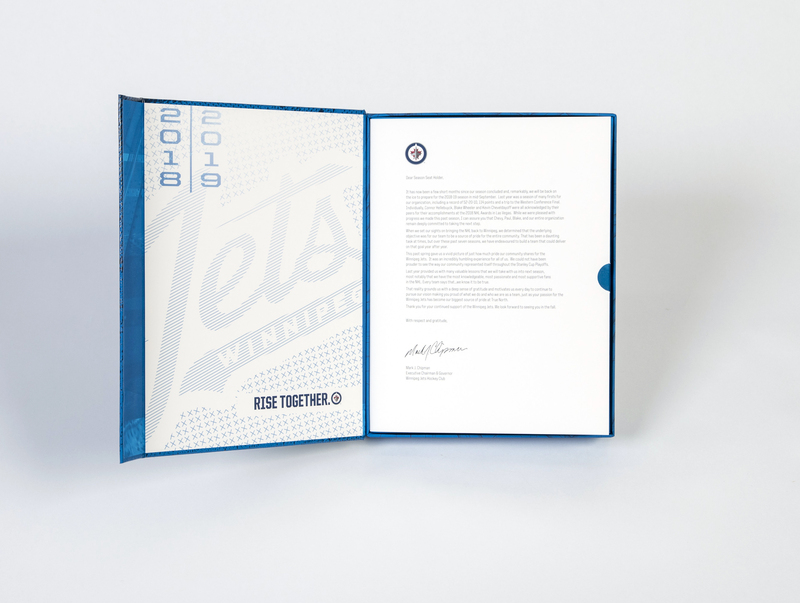 Fulfillment: Our team outfitted each season and suite ticket package with the correct collateral ensuring the team received a complete and ready to send finished package. 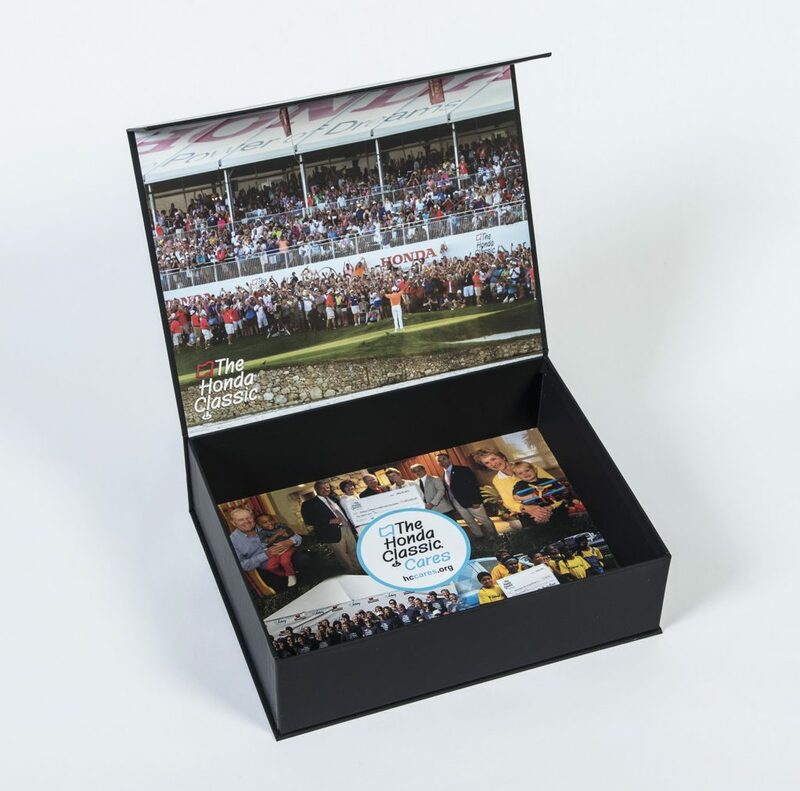 Inside & Outside Material and Finish: Fully printed with a Gloss Lamination throughout. 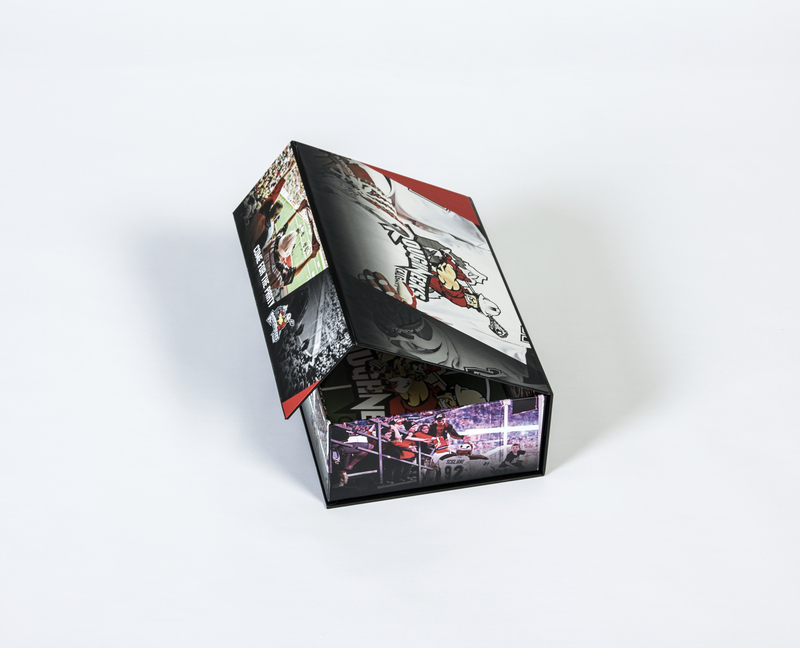 Special Features: The gloss finish allows the box to shine, showing off the sharp and colourful artwork. 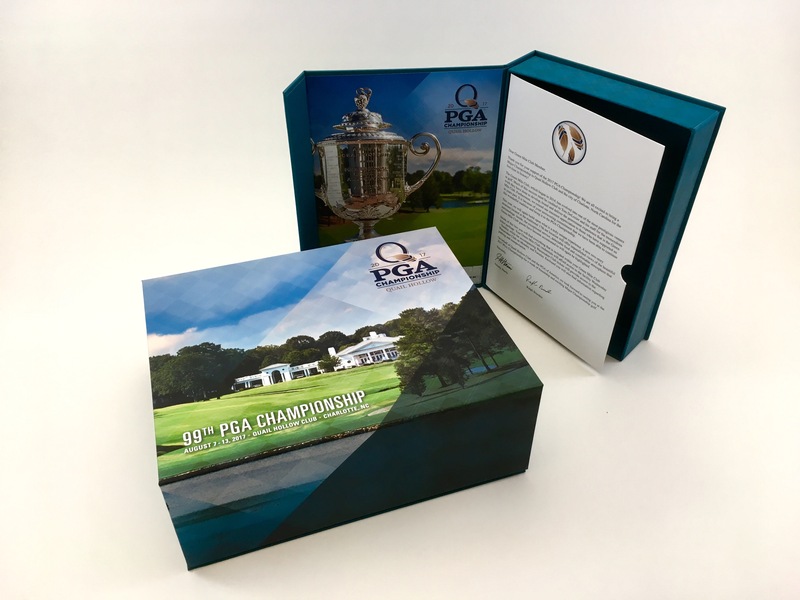 Special Features: The inside of this piece had two large components made of paper board bumpers to hold different collateral along with foam centered overtop. 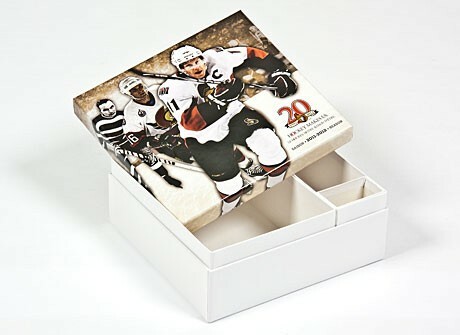 This gave the team plenty of space to place specific merchandise. 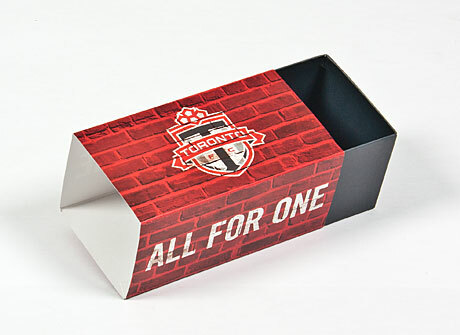 Outside Material and Finish: Fully printed throughout and finished with matte lamination. 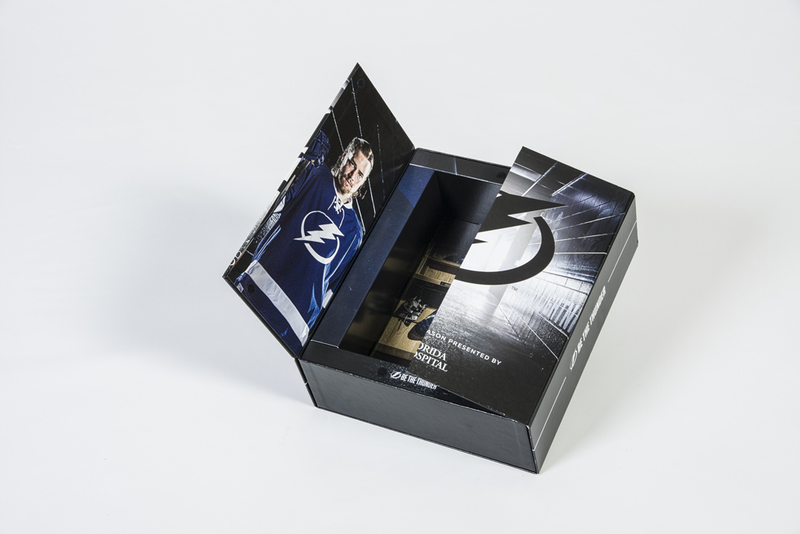 Inside Material: A black soft touch material was used to line the inside of the box for a high end look and feel. 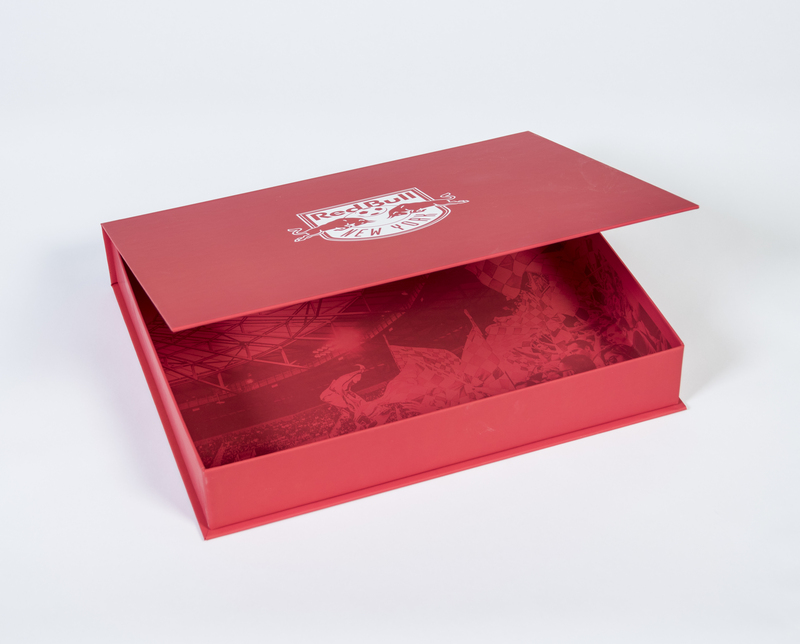 Special Features: The gloss finish allows the box to shine, showing off the sharp and specialized artwork. 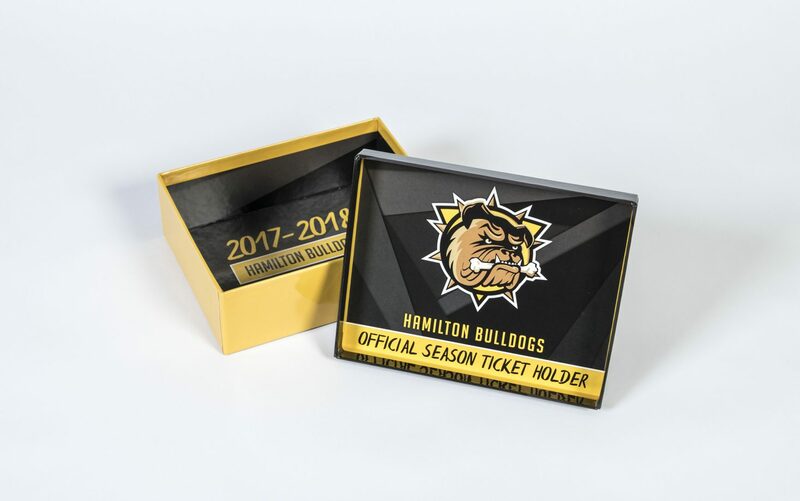 Special Features: This diecut folder allows plenty of space to hold a teams tickets, and collateral at a lower cost than many boxes. 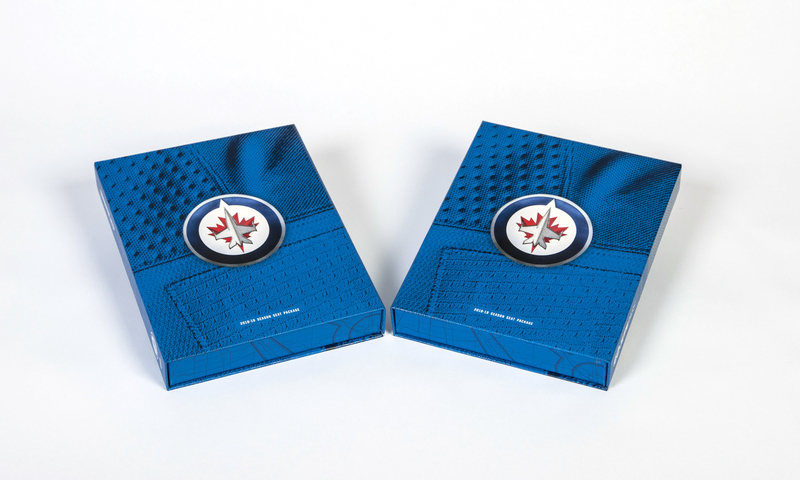 The flap overlaps and closes via Velcro for a very finished look. 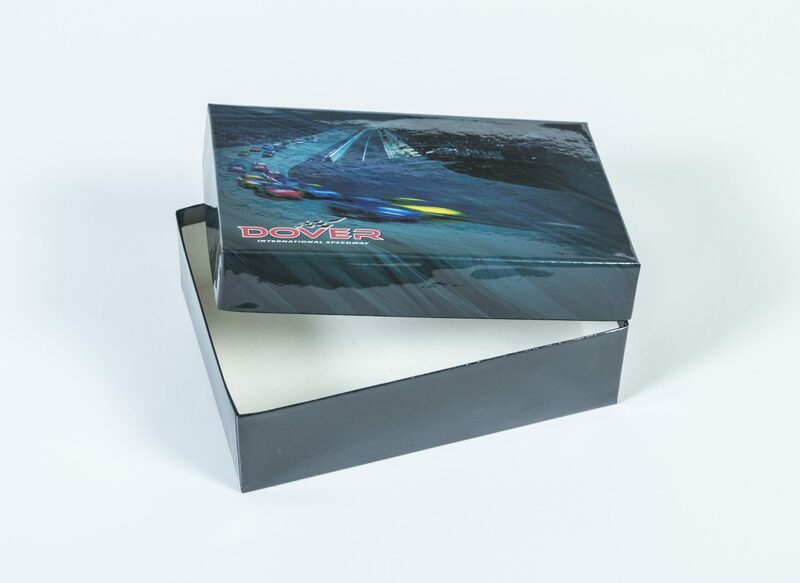 Inside & Outside Material and Finish: Fully printed with Matte Scuff Resistant Lamination. 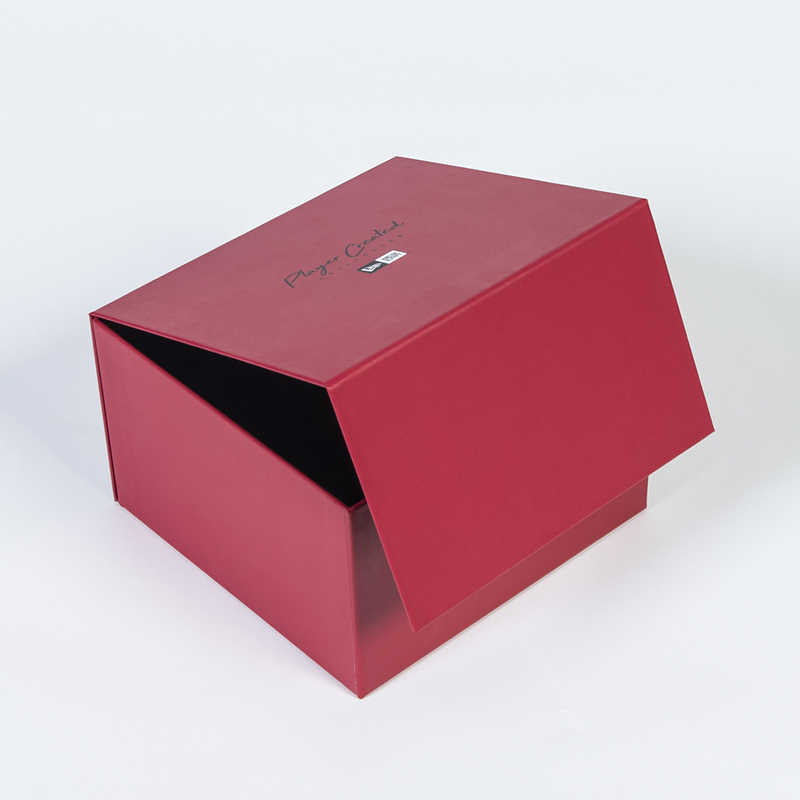 Special Features: The box has a ribbon which is used to pull the contents out of its case. 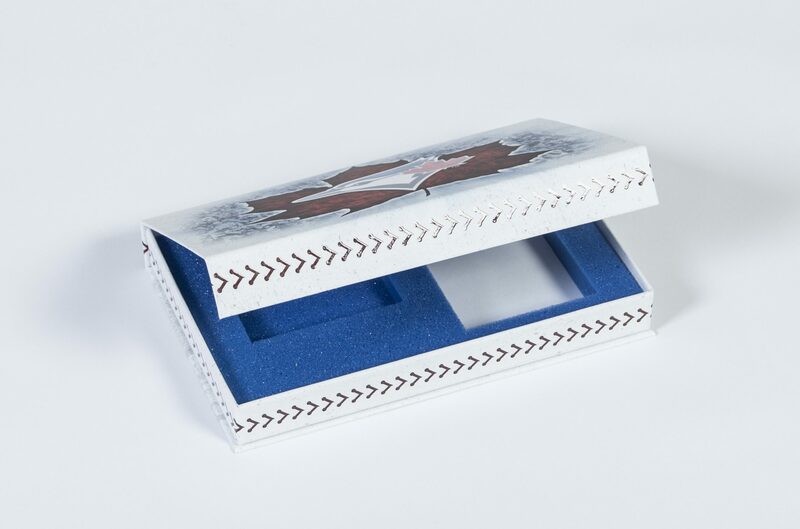 The contents were placed overtop a tray that had a flocked foam overtop to compartmentalize the merchandise. 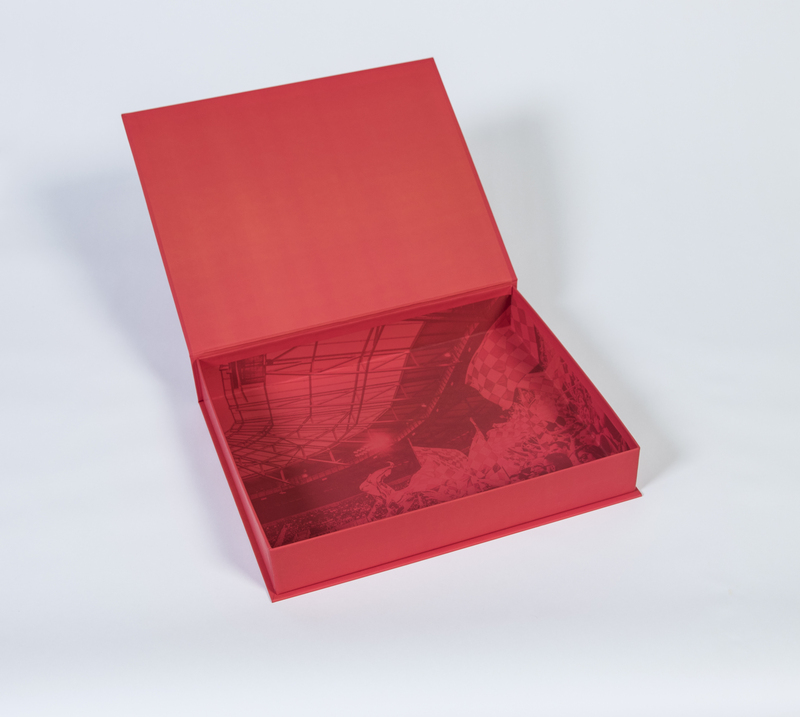 Special Features: The inside of this box has many separate paperboard compartments to hold different collateral. 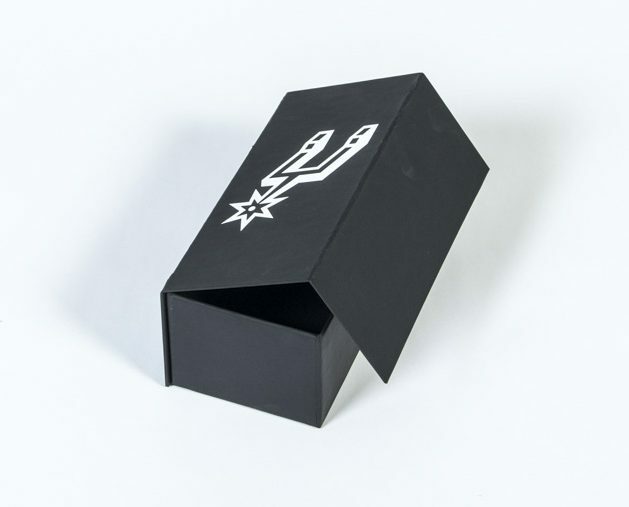 The box itself is what is known as a Neck Box. 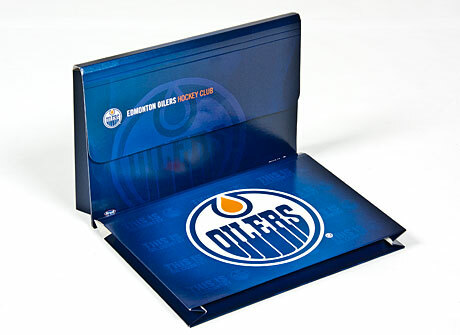 Special Features: This folder allows plenty of space to hold a teams tickets, and collateral at a lower cost than many boxes. 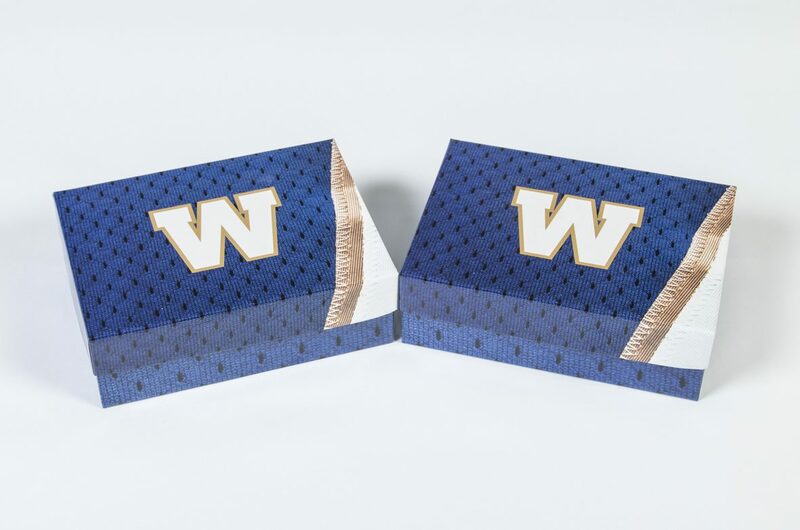 The flap overlaps and closes via Velcro for a very finished look. 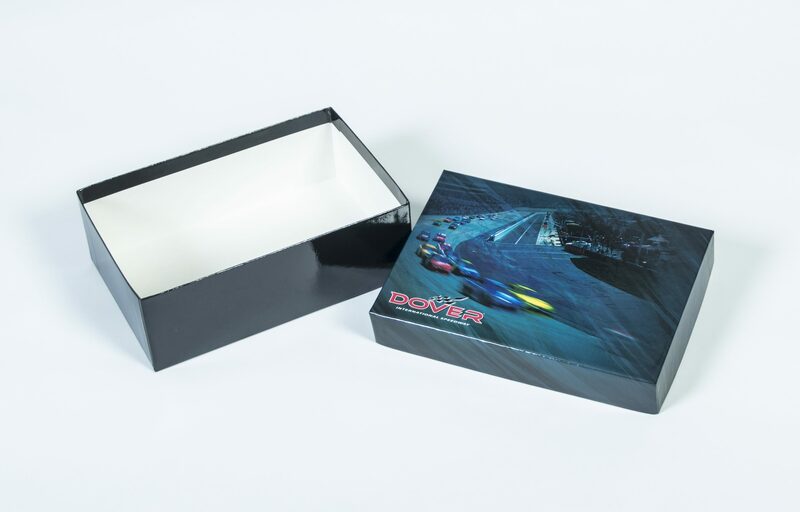 Inside & Outside Material and Finish: Fully printed with an Aqueous coated exterior. 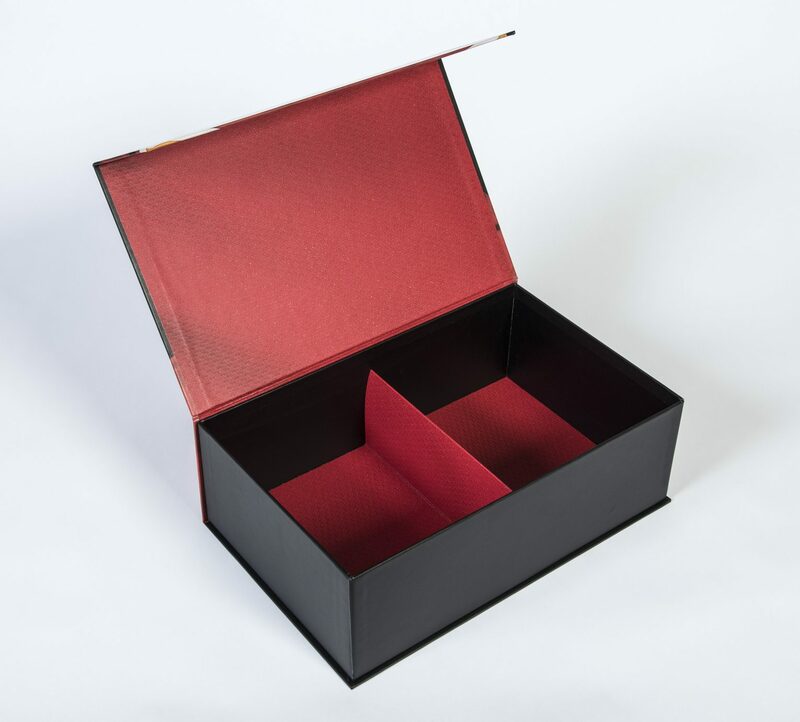 Special Features: The box is light weight and allows a complete easy to handle presentation piece with a thin sleeve overtop a rigid tray.